I needed to come in to the office today (Martin Luther King Day) to work on another blog because I am worried about the strong probability of yet another East African drought in March-May of 2018. I wanted to come in to work today because it is Martin Luther King Junior’s birthday, and this is one way of honoring his life. Dr. King has always been a personal hero, teaching us to care deeply for each other, fighting for our shared humanity in a non-violent way. It is not our genes that make us human, but rather our highest aspirations expressed in coherent action. I would like to dedicate this post to all the first responders in Africa and California, who have helped so many face the ravages of drought, fire, and flood. The main objective of this post is to summarize some of our climate change research, and link it to a pessimistic outlook for the March-May East African rains. But I can’t not mention that since the Whittier Fire broke out near my house in the woods on July 8th of 2017, it seems like disasters in Santa Barbara have been rampant. The Whittier fire burned through July, August, and September. Then October, November, and December were exceptionally dry (Figure 1) and hot (Figure 2). Many regions of the southwest have received less than half the amount of rain typically received by this point in winter. Even more striking, however, is the exceptional warmth, shown in Figure 2 averaged over the South Coast Drainage near Santa Barbara. Recent average air temperatures have been about 57° Fahrenheit. The 2017 air temperatures were about 61.5°F. This very warm weather and an almost total lack of rainfall resulted in very dry vegetation conditions. Everywhere I hiked this winter branches were brittle-dry, like matchsticks. Figure 1. October 1 2017-January 14th precipitation, expressed as a percent anomaly. Figure 2. October 1 2017-January 14th precipitation, expressed as a percent anomaly. When fall transitions to winter, the Santa Barbara area starts to get ‘sundowner’ and ‘Santa Ana’ weather conditions, which blow rapidly down from the mountains towards to the sea. Typically, these occur after it rains and pose little risk. This year, however, these winds were extremely rapid, up to 70 miles per hour, and raced across tinder-like branches. When a fire broke out behind the city of Ventura on December 4th, these intense winds combined with abundant super-dry vegetation and a spark, producing the massive Thomas Fire. While aperiodic, the spread of the fire over the remainder of the month was at times insane, advancing an acre a second, leaping up the coast towards Carpentaria and then Montecito and Santa Barbara. Then on Tuesday January 9th, a rainstorm struck the coastal mountains behind Montecito. Under normal conditions, such a storm would have had little impact. But the fire has been so recent the hills were bare, and the soil crusty; literally baked by the intense flames of the Thomas Fire. Today the Santa Barbara/Montecito community feels crushed by the weight of the resulting mudflow which tore down through Montecito in the very early morning at speeds of up to 20 miles per hour. The Thomas Fire had been horrible. It caused many of us to evacuate, and all of us to breathe ash-filled air for weeks. More than a thousand structures had burned in what had quickly become the largest wildfire in recorded history. But the fire response had been massive and very successful. More than 8,000 courageous firefighters, 100 fire engines, and dozens of helicopters, sent from all across the western US had come together to defeat the Thomas Fire. On January 9th we lost at least twenty lives in a terrible flood that ripped all the way down to the coast. The Thomas Fire was not even 100% contained until January 12th. While I am not an expert on California climate, I do think that there is an important climate feature that links California with East Africa: the Walker Circulation. Understanding this climate pattern helps inform successful predictions of drought, such as our group’s successful predictions of the 2016 October-December, 2017 March-May, and 2017 October-December droughts in East Africa. A recent assessment by the World Food Programme highlights the extent and some of the impacts of these sequential droughts: “This relentless sequence of climatic shocks together with insecurity and high food prices is having a profound negative impact on vulnerable populations”. Assessments by the Famine Early Warning Systems Network (FEWS NET) identify very large food insecure populations, especially in Somalia and Eastern Ethiopia. To understand how fragile some of these populations are it helps to understand how deep poverty impacts how people eat. World Bank data for Kenya and Ethiopia suggest that the poorest 20% of households live on $330 and $251 dollars per year per person. In very poor households, most of this money (~60%) will typically be spent on food. If you live among a very vulnerable pastoral community, making your living off the itinerant grazing of yours flocks, you have to depend heavily on food purchases. Droughts can inflict a triple threat – food prices go up, purchasing power and savings erode as livestock die, and weak and dying herds also stop producing milk and meat, important sources of calories. Figure 3. Schematic drawing showing the over-turning cells of the Walker Circulation. While there are a lot of complexities involved in East African climate, the predictable components on climatic time scales tend to be associated with a large circulation feature called the ‘Walker Circulation’ (named after another personal hero of mine, Sir Gilbert Walker). Figure 3 shows a schematic depiction of the Walker Circulation. The 2D drawing goes from the Earth’s surface to the top of the troposphere. Moving from left to right we start in Uganda and end up in the eastern Pacific. The Walker Circulation is centered on the equator, though across the east Pacific the sub-tropical high pressure cells extend poleward, keeping California sunny and dry. Near Indonesia (~130°E), where the Indian and Western Pacific oceans meet, we find extremely warm ocean waters. Above these warm waters we find lots of rainfall and ascending air. In the lower atmosphere, winds blow into this region from both the equatorial Pacific and Indian Ocean, helping to produce moisture convergence and ascending air motions. In the upper atmosphere (near 15 km) the atmosphere becomes very stable, and the ascending air parcels are shunted to the east or west. Most of the energy carried by these parcels ends up reinforcing the east Pacific sub-tropical highs. These high pressure cells, in turn, drive the Pacific trade winds that blow west towards Indonesia, reinforcing the Walker Circulation. It’s these cells that help make it dry and sunny in California. Over the Indian Ocean, there is also an Indian Ocean branch of the Walker Circulation. This circulation is associated with dry subsiding air over eastern East Africa, and dry hot surface conditions. To a large extent, eastern East Africa is dry because of the moisture and energy convergence over Indonesia. This convergence drives rising air, some of which sinks over East Africa. Climate variations like El Niños, La Niñas, and warming trends in the oceans can modulate the strength of the Walker Circulation, increasing or reducing the probability of East African droughts. Research by the Climate Hazards Group and FEWS NET (discussed below) has suggested that climate change is increasing the strength of the Walker Circulation, reducing rainfall during the March-May long rainy season, and increasing the impact of La Niña events. Declines in East African rainfall were first identified as part of our efforts to improve drought early data sets for the FEWS NET. Our early climate analyses correctly isolated the immediate cause of the drying (an intensification of the Indian Ocean branch of the Walker Circulation), but probably over-emphasized the role played by the Indian Ocean. In the early 2010s, we doubled down on our efforts to collect and analyze the best possible rainfall data, and published a series of reports for the US Agency for International Development. Our Kenya report, for example, showed the strong correspondence between a measure of low frequency warming, the Indo-Pacific Area Index and declines in Kenya rainfall. Most of this work has focused on the March-May rainy season. We have refined our ideas over time, going through the classic science progression of ‘description’, ‘explanation’, and ‘prediction’. Here I just recap some of the description, explanation, and prediction efforts, with the caveat that many have contributed to these papers and many other good studies have also been done (this is not an exhaustive literature review). A long list of publications is shown at the end of this post. With support from the FEWS NET, we have been able to invest heavily in building the best possible international data sets for East Africa (see A and B). While there is essentially no debate about the recent declines of the East African March-May ‘long rains’ these data sets let us say with confidence that there has been a large persistent increase in the frequency of poor East African seasons. Figure 4 shows a long time series of standardized rainfall averaged over eastern/central Kenya, southeastern Ethiopia, and Somalia. This image is from a recent paper, currently in final review. Figure 4. A long time series of rainfall for the region outlined in the left panel show a very large increase in the frequency of dry seasons. Since 1998, only 2010 and 2013 exhibited healthy long rains. Based on CHIRPS and Centennial Trends rainfall as described here: ftp://ftp.chg.ucsb.edu/pub/org/chg/people/chris/papers/Revised_Relating_Recent_Droughts_to_Extreme_SSTS_v6.pdf. Since 1998, only 2010 and 2013 exhibited above normal rainfall performance. Paleoclimate analyses by Jessica Tierney and co-authors also indicate a long term decline and a negative relationship to global warming. It should be noted that the October-December ‘short’ rains have not exhibited similar declines, probably due to warming in the eastern Indian Oceans. Nonetheless, the dramatic increase in the frequency of East African March-May droughts threatens the economic stability of poor households. More frequent climate shocks make it very hard to build up reserves and escape from a cycle of poverty. Our ability to explain the mechanisms behind the recent declines has been advancing quickly. This work has tended to emphasize the impact of the ‘West Pacific Warming Mode’ – a low frequency warming trend mode found in both the observed sea surface temperature record and climate change simulations. The warming mode pattern is associated with a characteristic ‘Western V’ sea surface temperature pattern over the Pacific. This pattern is also quite similar to the ocean temperature anomalies found during recent East African March-May droughts. Figure 5. Standardized March-May sea surface temperature composites based on signature East African drought years (1984, 2000, 2004, 2009, 2011). We can characterize the sea surface temperature patterns associated with these droughts by averaging conditions during recent severe dry seasons (Figure 5). This figure shows an area where warming is associated with less rainfall over East Africa (primarily the Western North Pacific, outlined with a yellow box), and an area in the eastern equatorial Pacific where warm (El Niño-like) sea surface temperatures are associated with more rainfall over East Africa. The area over the eastern equatorial Pacific is strongly influenced by El Niños and La Niñas – the major form of inter-annual climate variability. El Niños warm the east Pacific and slow the Walker Circulation. La Niñas do the opposite. At decadal time scales, sea surface temperatures in the east Pacific have not warmed substantially, and this is a major difference between the observed climate and predictions made by climate change models. The western Pacific, on the other hand, has tracked very closely with climate change predictions. This is an area where sea surface temperatures are strongly controlled by downwelling radiation. La Niñas also tend to produce warming as well. The combination of these two influences are shown in Figure 6 (details here). Western North Pacific Ocean temperatures have increased dramatically, in line with climate change predictions. It is important to note, however, that this region warms during La Niña events as well. 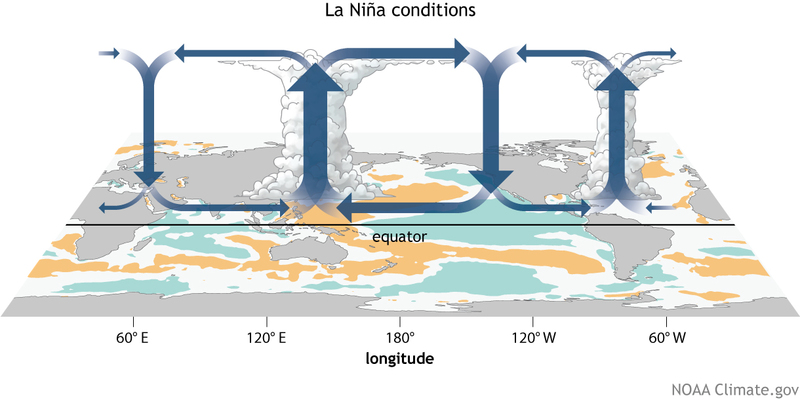 The combination of long term warming and the responses to La Niña events creates a strong gradient between the western and central Pacific amplifying the impact of La Niña events. Figure 6. The red line shows west Pacific sea surface temperatures from the yellow box in the previous figure. The blue line shows the same from a large set of climate change simulations. The green line shows estimates based on a combination of climate change averages and the influence of La Ninas and El Ninos. We can now explain fairly well why a ‘Western V’-like pattern amplifies the Walker Circulation, linking increases in sea surface temperatures (Figure 6) with declines in the East African long rains (Figure 4). Near the surface, equatorial sea level pressure values track closely with ocean temperatures. As shown by many recent studies, warm west Pacific Ocean conditions are associated with lower pressures and convergent low level winds that blow from the Indian and Pacific into the area around Indonesia, enhancing the Walker Circulation. Figure 7 quantifies the effects of the warming west Pacific by contrasting new (1981-2016) west Pacific warm events with old (1921-1980) warm events. This figure depicts rainfall and low level circulation changes based on a large set of atmospheric model simulations. The details of the drying signal over East Africa are not reproduced too well, but note the strong modulation of the moisture bearing winds over the Indian Ocean (blowing away from Africa). These simulations identify large (more than one and a half standardized anomaly) increases in precipitation over Indonesia. This indicates a large increase in the strength of the Walker Circulation (Figure 3), which tends to increase subsidence over East Africa, increasing the frequency of droughts. Figure 7. Composites of a large (20 member) ensemble of CAM5 atmospheric model simulations to diagnose changes in precipitation and low level (850 hPa) wind anomalies by contrasting 1981-2016 and 1921-1980 warm WNP events. Image produced by Laura Harrison. Figure 8. Here we present estimates based on ensemble climate change averages (blue line) and estimates based on climate change averages and the influence of ENSO, based on regressions with NINO3.4 sea surface temperatures. Looking further up in the atmosphere, things become even more interesting. Examining similar atmospheric change composites (Figure 8) we can see the full implications of a ‘Western V’ warming pattern. This map shows changes in upper level geopotential heights (i.e. the maps of high and low pressure systems we see in weather reports) along with changes in upper level winds. Over the northern and southern mid-latitudes, we see very large (~+50 m) increases in heights. These high pressure cells sit right underneath the sub-tropical westerly jet. Smaller, but equally important, are the increases in upper level heights found near Indonesia. Taken together, this pattern of high pressure sends upper level winds first to the west across the northern and southern Pacific near 30°N/S, and then turns those winds towards the central Pacific near the equator. These anomalous flows from the north and south converge east of 150°E, producing subsidence, and enhancing the Walker Circulation, creating a La Niña-like response. Over the western Indian Ocean we see an enhancement of the Indian Ocean branch of the Walker Circulation. When warm Western V conditions combine with cool La Niña conditions in the East Pacific, we are set to have an elevated chance of East African drought. Since 2012, we have been active participants in the special climate attribution issue of the Bulletin of the American Meteorological Society’s annual issue on extreme event attribution. This special issue examines each year’s extreme events, and formally assesses questions of climate attribution. Articles in these special issues ask: can extreme events from each year be attributed to anthropogenic influences? Our analysis of the 2014 East African March-May drought found: “Anthropogenic warming contributed to the 2014 East African drought by increasing East African and west Pacific temperatures, and increasing the gradient between standardized western and central Pacific SST causing reduced rainfall, evapotranspiration, and soil moisture”. Our analysis of the 2015 Ethiopian drought found: “Anthropogenic warming contributed to the 2015 Ethiopian and southern African droughts by increasing El Niño SSTs and local air temperatures, causing reduced rainfall and runoff, and contributing to severe food insecurity”. In general, our work suggests that both El Niño and La Niña-like climate disruptions may be made more intense by climate change, leading to opportunities for prediction. Our ability to predict long rains droughts has moved through three stages. During Stage 1 (~2004-2009) an increased drought frequency had been identified and related to the Walker Circulation. At this point we had little predictive skill. During Stage 2 (2010-13) we were identifying the link between Indo-Pacific warming and an increase in La Niña impacts on the Greater Horn of Africa. This helped support a successful prediction of the severe famine-producing 2010-11 drought. During Stage 3, we then started making the link between the west Pacific gradient and using statistical models to predict East African droughts. These latter efforts are quite similar to the successful Climate Outlook Forum process used by East African scientists. This work is important, because dynamic forecast models still continue to miss major drought events, such as the March-May and October-December droughts from 2017 (Figure 9 and 10). Partnering with many agencies we were able to use ‘Stage 3’ type forecasts to provide an effective early alert before the poor March-May 2017 season. In the early spring of 2017, timely humanitarian response helped prevent a repeat of the catastrophic runaway food prices seen in 2011. Unfortunately, we may be looking at yet another poor rainy season. The rest of this post describes a statistical forecast for the March-May 2018 season. Figure 9. International Research Institute rainfall forecast for March-May 2017. Figure 10. International Research Institute rainfall forecast for October-December 2017. We begin by looking at the correlation between observed 1998-2017 CHIRPS rainfall over central/Eastern Kenya, all of Somalia, and central/southeastern Ethiopia (see Figure 3 from here for the precise region) and observed December NOAA Extended Reconstruction sea surface temperatures (Figure 11). We find a fairly strong negative correlation with the ‘Western V’ and a fairly strong positive correlation with the equatorial eastern Pacific. This relationship holds up reasonably well back to about 1993, but then seems to disappear, leading some climatologists to claim that the long rains are weakly linked to Indo-Pacific sea surface temperatures and relatively unpredictable. Our view on this subject is quite different. Figure 11. 1998-2017 correlations between observed March-May East African rainfall and December sea surface temperatures. Following the very large 1997/98 El Niño, sea surface temperatures in the west Pacific warmed substantially (Figure 6). La Niña-like March-May seasons have been associated with much larger Walker Circulation intensifications (Figure 7), that draw near surface winds over the Indian Ocean away from Eastern Africa (Figure 8). Looking at the upper-troposphere (Figure 8), we see large increases in the westward winds over East Africa, characteristic of an enhancement of the Indian Ocean branch of the Walker Circulation (Figure 3). This enhancement can help explain the emergent correlation structure plotted in Figure 11 and the fact that ‘new’ La Niñas appear to have a stronger negative impact on the East African long rains. Figure 8 also helps understand the correlation pattern shown in Figure 11. ‘Western V’ warming in the blue areas of Figure 11 tends to increase upper level heights with the ‘U’ shaped pattern shown in Figure 8. Cooling in the red/orange areas of Figure 11 tends to reduce upper level heights within the two central Pacific cyclones shown in Figure 8. So, dynamically, the Western V warming and central Pacific cooling patterns tend to fit ‘hand-in-glove’. The upper-level cyclones produced by cool central Pacific conditions slot neatly within the surrounding height increases associated with warmer Western V sea surface temperatures, produce intense convergent wind patterns and subsidence across the eastern equatorial Pacific. This enhances the Walker Circulation and increases the frequency of droughts over East Africa. Figure 12. December 2017 NOAA Extended Reconstruction Version 4 sea surface temperature anomalies. Based on a 1981-2010 baseline. Conditions in December of 2017 (Figure 12) appear conducive to below-normal March-May 2018 rains. We see generally warm conditions across the ‘Western V’ region and La Niña sea surface temperatures across the eastern equatorial Pacific. We use the magenta and cyan regions from Figure 12 to develop predictive relationships. Figure 13. Scatterplot between December Western V sea surface temperatures and March-May East African precipitation. Figure 14. Scatterplot between December East Pacific sea surface temperatures and March-May East African precipitation. Figures 13 and 14 show, respectively, scatterplots between 1998-2017 December Western V and eastern Pacific sea surface temperatures and standardized March-May East African rainfall. Both predictive relationships are similar in magnitude (R=-0.70 and +0.68). Red dots in Figure 13 and 14 show estimated outcomes for March-May 2018, based on each individual predictor. The results are quite similar, with forecasts of about a -1 standard deviation rainfall deficit. Figure 15 shows the 1998-2017 Western V and East Pacific sea surface temperature values. Note that these time series are also inversely correlated (R=-0.70). This year appears typical for a recent moderate La Niña/East Africa drought season. Some Decembers looked worse (1998, 1999, 2010 and 2011), but many (13) Decembers looked better, so we might expect to find ourselves in the below normal rainfall tercile. The 2007, 2000, and 2016 seasons might be close analogs. The 2017 conditions appear much more characteristic of new drought years than 2016. That year was atypical, in that we had very warm Western V sea surface temperatures and fairly neutral East Pacific conditions. Figure 16. Scatterplot of predicted and observed East African precipitation values. Green circles show estimates based on take-one-away cross validation. The red circle shows the 2018 forecast, along with 80 percent confidence intervals. We can use cross-validation to produce 1998-2017 forecasts for March-May 2018 (Figure 15). This forecast indicates a high probability of below normal rains. Note that this scatterplots suggests that we can identify most (eight out of nine) poor rainy seasons with a very low false alarm rate. We also see this in our Western V and East Pacific scatterplots (Figures 13 and 14); when Western V or East Pacific sea surface temperatures a particularly warm or cold (respectively) we do not see above normal Eastern East African March-May rains. Our below normal forecast appears broadly consistent with the most recent National Multi-Model Ensemble climate model forecasts. These forecasts also call for an end to La Niña conditions by mid-spring. This could alter the seasonal outlook substantially. This transition might suggest a more pessimistic outlook for the early part of the rainy season. Such transitional conditions tend to translate into more certainty for farmers in marginal areas. In semi-arid crop growing regions of central-eastern Kenya, Southern Somalia and Belg-dependent regions of Ethiopia, typical growing seasons are already short, so poor rains during the first half of the rainy season can be very disruptive. A poor Somali Gu harvest outlook may be one of the impacts of these predicted dry conditions, since this growing season is so short. Unfortunately, many of the La Niña high risk regions correspond to regions that received very poor rainfall totals over the prior three seasons: October-December 2016, March-May 2017, and October-December 2017 (Figure 17). Some regions of eastern Kenya and southern Somalia also experienced poor March-May 2016 conditions, and may be looking at five poor rainy seasons in a row. Figure 17. Total CHIRPS rainfall for October-December 2016, March-May 2017 and October-December 2017 expressed as an anomaly from the 1981-2016 average. Funk C, J. Michaelsen and M. Marshall (2012) Mapping recent decadal climate variations in precipitation and temperature across Eastern Africa and the Sahel, Chapter 14 in “Remote Sensing of Drought: Innovative Monitoring Approaches”, edited by B. Wardlow, M. Anderson and J. Verdin, Taylor and Francis, 25 pages. Liebmann, B., Bladé I., Kiladis G. N. , Carvalho L. M. V., Senay, G., Allured D., Leroux S., Funk C (2011) African Precipitation Seasonality Based on Daily Satellite Data from 1996-2009, J. of Climate, Journal of Climate 25, no. 12 (2012): 4304-4322. Funk C., G. Husak, J. Michaelsen, S. Shukla, A. Hoell, B. Lyon, M. P. Hoerling, B. Liebmann, T. Zhang, J. Verdin, G. Galu, G. Eilerts, and J. Rowland, 2013: Attribution of 2012 and 2003-12 rainfall deficits in eastern Kenya and southern Somalia [in “Explaining Extreme Events of 2012 from a Climate Perspective”]. Bull. Amer. Meteor. Soc., 94, S45-S48. Hoell A. and C. Funk (2013) Indo-Pacific Sea Surface Temperature Influences on Failed Consecutive Rainy Seasons over Eastern Africa, Climate Dynamics, DOI: 10.1007/s00382-013-1991-6. p1-16. Hoell, A., Funk, C., & Barlow, M. (2013). The regional forcing of Northern hemisphere drought during recent warm tropical west Pacific Ocean La Niña events. Climate Dynamics, 1-23. Liebmann, B., Hoerling M., Funk C., Dole, R. M., Allured A., Pegion, P., Blade I., Eischeid, J.K, (2014) Understanding Eastern Africa Rainfall Variability and Change, Journal of Climate. Funk, C., Hoell, A., Shukla, S., Bladé, I., Liebmann, B., Roberts, J. B., and Husak, G. (2014). Predicting East African spring droughts using Pacific and Indian Ocean sea surface temperature indices. Hydrology and Earth System Sciences Discussions, 11(3), 3111-3136. Shukla, S., McNally, A., Husak, G., & Funk, C. (2014). A seasonal agricultural drought forecast system for food-insecure regions of East Africa. Hydrology and Earth System Sciences Discussions, 11(3), 3049-3081. Shukla S., Funk C. and Hoell A. (2014) Using constructed analogs to improve the skill of March-April-May precipitation forecasts in equatorial East Africa , Env. Res. Letters, Environmental Research Letters 9.9 (2014): 094009. Funk, C., Hoell A., Husak G., Shukla S. and Michaelsen J. (2015) The East African monsoon system: seasonal climatologies and recent variations. Chapter for “The Monsoons and Climate Change”, Leila M. V. Carvalho and Charles Jones (Eds.) https://doi.org/10.1007/978-3-319-21650-8_1. Funk C., Nicholson S. E., Landsfeld M., Klotter D., Peterson P. and Harrison L. (2015) The Centennial Trends Greater Horn of Africa Precipitation Dataset, Scientific Data, 2, 150050. DOI: 10.1038/sdata.2015.50. doi:10.1038/sdata.2015.50. Funk, C., Shukla S., Hoell A. and Livneh B. (2015) Assessing the contributions of East African and west Pacific warming to the 2014 boreal spring East African drought, BAMS Climate Attribution Issue. 96.12 (2015): S77-S82. Shukla S., Roberts, J., Hoell A., Funk C., Robertson F. and Kirtmann, B. (2016) Assessing North American Multimodel Ensemble (NMME) Seasonal Forecasts, Climate Dynamics. 1-17. Funk, C., Harrison L., Shukla S., Hoell A., Korecha D., Magadzire T., Husak G., and Galu G., 2016, Assessing the contributions of local and east Pacific warming to the 2015 droughts in Ethiopia and Southern Africa, Bulletin of the American Meteorological Society, December 2016, S75-S77. Funk, C and Hoell A. (2017) Recent Climate Extremes Associated with the West Pacific Warming Mode, AGU Monograph-Climate Extremes: Patterns and Mechanisms. Ed. by Simon Wang, Jin-Ho Yoon, Chris Funk and Robert Gillies, published by Wiley Press (2017): 165. ISBN: 978-1-119-06784-9. Liebmann B., Bladé I., Funk C., Allured D., Hoerling, M., Hoell, A., Peterson, P., Thiaw, M.T. (2017) Climatology and Interannual Variability of Boreal Spring Wet Season Precipitation in the Eastern Horn of Africa and Implications for its Recent Decline, J. Climate, Journal of Climate 30.10 (2017): 3867-3886, https://doi.org/10.1175/JCLI-D-16-0452.1. Brown M.E., Funk, C., Pedreros, D., Korecha D., Lemma M., Rowland J., Williams E. and Verdin, J. (2017) Climate Trend Analysis of Ethiopia-Examining Subseasonal effects on Crops and Pasture Conditions, Climatic Change, DOI 10.1007/s10584-017-1948-6. Funk C, Davenport F, Harrison L, Magadzire T, Galu G, Artan G, Shukla S, Korecha D, Indeje M, Pomposi C, Macharia D and Husak G (2017) Anthropogenic enhancement of moderate-to-strong El Niños likely contributed to drought and poor harvests in Southern Africa during 2016, Bulletin of the American Meteorological Society, 37.S1-S3, DOI. 10.1175/BAMS-D-17-0112.2. Philip S, Kew S.F., Jan van Oldenborgh G, Otto F, O’Keefe S, Haustein K, King A, Zegeye A, Eshetu Z, Hailemariam K, Singh R, Jjemba E, Funk C, Cullen H, Attribution analysis of the Ethiopian drought of 2015, J. Climate, https://doi.org/10.1175/JCLI-D-17-0274.1. Funk C, McCormick S, Galu G, Massawa, E., McCormick S, Omondi P, Sebina E, Shitote S, White L (2017), Climate Change Vulnerability Impact Assessments and Adaptation in East Africa, Summary for Policy Makers, USAID PREPARED Project. Nicholson, SE, Funk, C. and Fink A (2017) Rainfall over the African continent from the 19th through the 21st century, J Global and Planetary Change, In Press. Funk C, Harrison L, Shukla S, Pomposi C, Galu G, Korecha D, Husak G, Magadzire T, Davenport F, Hillbruner C, Eilerts G, Zaitchik B and Verdin J (2017) Examining the role of unusually warm Indo-Pacific sea surface temperatures in recent African droughts, Q. J of the R. Meteorological Society. In Review, minor revisions. Average to mildly above average crop success anticipated for much of the major maize producing areas of Southern Africa, with pockets of moderately reduced crop success in subsistence farming and livestock grazing regions. The Water Requirement Satisfaction Index (WRSI) is a water balance model that incorporates crop parameters such as the length of growing season and phenological information, along with soil characteristics. This model is commonly used to monitor growing seasons throughout Africa and Central America by the Famine Early Warning Systems Network (FEWSNET). Specifically, the model uses gridded precipitation and reference evapotranspiration (RefET) inputs to calculate the ratio of plant-available water to crop-specific water demand at each stage of crop development. This post describes a real-time monitoring application to examine the progress of the Southern Africa 2017-2018 maize growing season, at approximately the halfway point of the season. The analysis combines September, October, and November final CHIRPS rainfall estimate (reference link, data link), and December CHIRPS Preliminary data (data link) to identify the to-date 2017-18 Start of Season (Figure 1). The dekad identified as the Start of Season (SOS) for a location (pixel) is defined as the first dekad with at least 25 mm of rainfall followed by a total of at least 20 mm in the next two consecutive dekads. For the example shown here, which only has data through the end of December, dekads 2 and 3 of December only use the 25 mm threshold to identify a potential start. Whether or not the second threshold was met cannot be determined until January CHIRPS Prelim is released. All areas that have not met these requirements by the third dekad of December are labeled as ‘Yet to Start’ (see the areas of Figure 1 in light gray color). Historical CHIRPS (1981-2016) was used to identify the SOS for each of the last 36 years, and calculate the median historical SOS (Figure 2). Figure 1. 2017-18 start of season as of December 31, 2017. Areas colored gray have yet to receive sufficient rainfall for a season start. Figure 2. Median start of season based on CHIRPS from 1981-2016. Areas colored pink consistently do not receive sufficient rainfall for a season start. To examine the potential outcomes of the current season, 36 WRSI scenarios were run using the result from Figure 1 as the SOS. To get credible simulations of the season, hybrid composites of both precipitation and RefET¹ were created using season-to-date information and previous years to estimate one potential remainder to the season. The precipitation input of each scenario used 2017 CHIRPS final through November and 2017 CHIRPS Prelim for December. The RefET input used 2017 data through September. Because RefET is not available for October-December of 2017 due to the latency of the dataset, these 9 dekads were filled with average RefET. The 36 season scenarios were then run to completion using corresponding year-specific CHIRPS and RefET (i.e. Scenario #1 used 2017 data for Sep-Dec, and 1981 data for Jan-May; Scenario #2 used 2017 data for Sep-Dec, and 1982 data for Jan-May; etc.). To build a library of historical WRSI output, the WRSI calculation was run using the 36 years of historical SOS from Part 1 of the examination and historical CHIRPS and RefET. Investigating the difference of the median historical SOS (Figure 2) from this season’s SOS (Figure 1) reveals the timeliness of the current season (Figure 5). The median of the 36 2017-18 WRSI scenarios (Figure 3) was then compared to the WRSI median of the historical runs (Figure 4) to find the simulated WRSI anomaly (Figure 6). WRSI Colormap for Figures 3 & 4. Figure 3. Median WRSI for the 2017-18 maize growing season, based on 36 scenarios. Areas colored cyan have not yet received sufficient precipitation for a season start. Figure 4. Historical median WRSI for the Southern Africa summer maize growing season, based on 1981-2016 WRSI. Areas colored pink consistently did not receive sufficient rainfall for a season start. Figure 5. 2017-18 start of season anomaly with respect to the 1981-2016 median SOS. Areas colored in shades of blue indicate regions where the current season started earlier than the historical median, while areas colored in shades of red started late. Areas colored orange indicate regions that are past the median SOS for that location and still have yet to receive sufficient rainfall for a season start. Areas colored beige have not yet started, but are not beyond the median start date. Figure 6. 2017-18 simulated end of season WRSI anomaly with respect to the 1981-2016 median WRSI. Areas colored beige have yet to receive sufficient rainfall for a season start in 2017-18. Comparing the graphics shown in Figure 5 and 6 we identify some interesting patterns, and can summarize how changes in SOS may impact this season’s crop production in Southern Africa. Major production zones in the Maize Triangle of South Africa, Northern Zimbabwe, Central and Northern Mozambique and Malawi experienced slightly early to on-time SOS (Figure 5). As a result of this, these areas are all showing average to above-average WRSI (Figure 6) using this analysis. More marginal production zones in Southern Zimbabwe and Southern Mozambique, where subsistence farmers are dependent on local production for their food security, experienced more extreme SOS anomalies (early in Zimbabwe, late in Mozambique). These anomalies are leading to below-average WRSI anomalies. Throughout much of Botswana and West-central South Africa, there has been a lack of seasonal onsets. These delays are anticipated to have negative impacts on the crop growing season, even if rain begins in early January. This analysis is currently experimental, but we think it should be insightful in identifying areas which are likely to experience crop production anomalies early in the season. We will continue to monitor throughout the growing season. The next logical step would be to start including CHIRPS-GEFS forecast to get projected rainfall information, identify the chances of SOS in the upcoming dekad, and then use that to forecast rest-of-the-season progress. This analysis has two objectives: to i) provide a timely multi-agency assessment of the forthcoming short and long rainy seasons for eastern East Africa, while also ii) advancing towards a multi-agency paper describing a ‘FEWS NET Integrated Forecast System’ (FIFS). The main ideas behind FIFS are to improve the accuracy of seasonal precipitation forecasts by using statistical ‘Model Output Statistic’ (MOS) reformulations based on output from coupled ocean-atmosphere models, such as the North American Multi-Model Ensemble (NMME). Note that while the work presented here is ‘experimental’, it is backed by years of FEWS NET research and successful forecasts based on similar approaches. The basic relationships used to drive these forecasts involve La Niña-like modifications of the Walker Circulation, which FEWS NET research, motivated by the 2011 famine in Somalia, has shown to be a key driver of droughts during both the October-November-December ‘short’ rains and the March-April-May ‘long’ rains. Please see the list of papers at the end of this report. The method explored here is called ‘adaptive regression’ (AdReg), which is an outgrowth of the modified constructed analog approach explored by Shukla and Funk. AdReg is also similar to the process that an expert statistical climate forecaster might carry out, i.e. similar to the approaches used to derive outlooks for climate outlook fora. AdReg has two steps: selection and estimation. AdReg employs three selection criteria: correlation, activity, and dynamic significance. In this application, ensemble average NMME precipitation fields will be used as predictors. We will use October-November-December (OND) NMME forecasts to predict OND eastern East African (EEA) rainfall and OND NMME forecasts to predict MAM EEA rainfall. This work has been motivated by the severe food crisis in EEA. As announced in a recent FEWS NET alert, the prospect of a fourth, and perhaps even a fifth, consecutive drought looms over East Africa due to the emerging La Niña-like sea surface temperature conditions. At present, the world faces an extremely high level of food insecurity, with an estimated 81 million people requiring urgent assistance. In East Africa, consecutive droughts have pushed millions to edge of starvation. In Somalia, food insecurity remains very high, with close to a million people (more than 800,000) facing near-famine (Emergency) conditions, another 2.3 million people in a severe food crisis, and another 3.1 million facing substantial food stress; an estimated 388,000 children under the age of five are acutely malnourished. In Kenya, persistent high food prices continue to drive high levels of food insecurity. In the Somali region of Eastern Ethiopia food security conditions are approaching famine conditions, and over all there are ~5-10 million Ethiopians in facing acute food insecurity. Figure 1 shows the early October Integrated Phase Classification (IPC) food insecurity outlook map from www.fews.net. Orange and red areas in this map indicate areas experiencing a severe food crisis (orange) or emergency (red). These shades indicate severe food stress. For this study, we have selected the area outlined in black. This region was selected because of its high level of food insecurity, regional homogeneity, and fairly good data support. Over the past thirty years, rainfall in this region during the OND season has remained fairly steady, probably due to the beneficial influence of warming western Indian Ocean SSTs. Rainfall during the MAM long rains, however, has declined substantially. Figure 2 shows a 1900-2017 March-April-May Standardized Precipitation Index (SPI) for this area, based the Centennial Trends (1900-1980) and CHIRPS (1981-2017) data sets, centered on a 1981-2010 baseline. The Centennial Trends and CHIRPS datasets are highly correlated (0.93) over the 1981-2014 time period. What is striking about Figure 2 is large frequency of dry seasons since 1999. Only 2010 and 2013 experienced good rainfall performance. The onset of La Niña-like climate conditions combined with warm SSTs in the western Pacific could set the stage for another sequence of back-to-back droughts during the OND 2017 and MAM 2018 long rains. Figure 2. Eastern East Africa MAM Standardized Precipitation Index time series. Here, we make AdReg forecasts based on the ensemble average of the latest NMME model simulations. Bias corrected precipitation simulations have been provided by Brent Roberts and the NASA SERVIR program. These forecasts have been bias corrected using Global Precipitation Climatology Center precipitation fields. In general, the NMME models predict moderate La Niña conditions (Figure 3) during the fall and winter of 2017/18, followed (in most models and simulations). In Figure 4 we see the NMME OND precipitation forecast. Consistent with a moderate La Niña forecast and moderately warm West Pacific SSTs, we see strong subsidence at the dateline near the equator. Such subsidence is typically a robust indicator of an enhanced La Niña-like amplification of the Walker Circulation. Over East Africa, we see a general tendency to slightly above normal rainfall. An examination of historical correlation between the NMME and OND rainfall in our target region, will question and revise this assessment (below). Here we explore the application of ‘adaptive regression’, a new type of statistical reformulation being developed by FEWS NET. AdReg filters potential global climate predictors by three criteria: correlation, activity, and dynamic significance. Correlation is based on the historical correlation between our target and each locations historical SST or precipitation forecast time series. Our main target is 1997-2016 OND rainfall in our Eastern East Africa study site (Figure 1). We begin by using a threshold of |0.5| as our criteria for correlation. Figure 5 shows the correlation between OND EEA precipitation and the NMME forecast SST and Precipitation. Correlation values less than 0.5 and greater than -0.5 have been set to 0. For OND we see a positive-negative-positive relationship to SST in the Western Indian, Western Pacific and Eastern Pacific Ocean. The precipitation correlation pattern looks similar to that shown in diagnostic analyses of the short rains. Note, however, the details of the correlation structure over Eastern Africa and the Indian Ocean. During dry EEA OND years, the model produces strong subsidence and drying to the east of East Africa, primarily over the Indian Ocean. In the actual NMME forecast (Figure 5), conditions are fairly neutral in this area, and fairly active over the ENSO-related regions of the western and eastern Pacific. To generate AdReg forecasts, we follow two steps: selection and estimation. AdReg employs three selection criteria: correlation, activity, and dynamic significance. Here we use correlation threshold of 0.5, a standardized anomaly threshold of 0.5Z, and a mean precipitation threshold of 30 mm for these criteria. NMME locations a historical correlation of less than -0.5 or greater than +0.5 are retained. We next screen for activity. Areas that have a standardized anomaly, in this season, of less than -0.5Z or greater than +0.5Z are retained. We then screen for ‘dynamic significance’; areas with long term average NMME precipitation of less than 30 mm are not used. Figure 6 shows an example of masking, based on the 2017 OND forecast process. Figure 5. Correlation between observed 1982-2016 EEA OND precipitation and 1982-2016 NMME Precipitation forecast made in early October. Figure 6. Mask used to predict the OND 2017 rains. Orange areas are positively correlated with observed EEA OND rainfall. Blue areas are negatively correlated. The next step in the AdReg process calculates the first and second principal components (PCs) of the NMME forecasts. As an example, Figure 7 shows the correlation between the first AdReg principal component and the NMME precipitation predictions. This is an ENSO signal. The final step uses regression to translate the PCs into forecasts of the predicted target. Take-one-away cross-validation is used to assess the out-of-sample skill of the AdReg procedure. For each year, that year’s data is withheld, the AdReg process calculated and then forecast accuracy is evaluated. It should be noted that selection processes can create artificial skill, even when using cross-validation. The AdReg process attempts to minimize this effect by working with the low order principal components of the NMME forecasts. In the NMME models, this often corresponds with ENSO-like patterns of variability. The results presented here tend to focus on ENSO-like patterns similar to those studied in FEWS NET diagnostic analyses (see papers below). Figure 7. Correlation between AdReg PC1 and the OND NMME precipitation forecasts. We begin by presenting (Figure 8) results for OND 2017 based on a model with masking based on a historical correlation of |0.5|, as standard anomaly of at least ±0.5Z and a mean precipitation rate of 30 mm. This model performs fairly well (cross-validated correlation of 0.68 with standard error of 0.8Z). While some droughts are missed, most are captured fairly well, including droughts in 2010 and 2016. A brief sensitivity analysis (Table 1) indicates fairly robust performance across our model criteria, except for when we set the correlation value to a high value (0.7). These strict criteria likely induces over-selection which performs poorly under cross-validation. Also shown in table 1 are cross-validated correlation and standard error values based on the raw NMME OND forecasts over the study area. While the models have some skill (r=0.45), AdReg skills are higher. A correlation of 0.45 implies explaining ~20% of the variance, AdReg correlations (~0.68%) imply explaining 46% of the variance. Raw NMME forecasts, regressed against the target, are shown in Figure 8 (triangles). These results are based on the bias corrected NMME forecasts, more experimentation with the underlying NMME precipitation fields will be examined in later analyses. The outlook for the OND EEA rains based on AdReg is -0.8Z ± 1Z, based on 80% confidence intervals. Below normal appears to be the most likely outcome. Figure 8. AdReg forecasts for EEA OND rains. Cross-validated results for 1982-2016, and the 2017 forecast. Bars denote 80% confidence intervals. Also shown are estimated based on regression with the raw EEA OND NMME (triangles). Table 1. Sensitivity Analysis for the OND Rains. We next examine the relationship between the NMME OND precipitation forecasts and historical MAM EEA precipitation. We use the past 20 years (1998-2017), because FEWS NET research has shown a much stronger teleconnection with La Niña following the 1997/98 El Niño event, when the western Pacific SSTs increased substantially. Interestingly, we see quite a strong correlation between the OND NMME precipitation forecasts and the observed MAM EEA rainfall in the following spring (Figure 9). This ENSO-like pattern likely indicates the likelihood of a persistent overturning circulation that continues to disrupt rainfall across the tropics. The magnitude of these correlations is quite high (~±0.7). The cross-validated AdReg correlation is high (+0.7), with a fairly low standard error (0.69Z). The associated 2018 forecast would be -0.6Z ± 0.9Z; a below normal outlook with considerable uncertainty. Figure 10 shows the scatterplot of cross-validated forecast results, along with the 2017 and 2018 MAM forecasts. Figure 10 shows the corresponding NMME correlation pattern for the MAM AdReg forecast; again a strong ENSO-like pattern (the PC1 time series is dominated by strong ENSO-like inter-annual variations). These results suggest, in line with numerous studies, that La Niña-like conditions are associated with dry conditions over the easternmost section of equatorial East Africa. The NMME can successfully anticipate such conditions, and provides a very useful guide to anticipating East African hydrological extremes. By focusing on the models’ large scale representation of ENSO, AdReg can be used to produce skillful automated forecasts, in early October, for both the short and long rains. For the short rains, our level of confidence might be quite high, since we have already begun the season, rainfall to date is slow to start, we can see evidence of a La Niña-like transition in the observed circulation, and near-term weather predictions tend to be pessimistic, at least over large parts of East Africa. If October is dry, the overall season will likely be poor (Figure 11). Our level of confidence in the MAM 2018 outlook is lower, given the large span of time, and the good possibility that La Niña-like conditions may fade. On the other hand, our forecast of -0.6Z is also quite similar to the ‘New Normal’ implied in the long term decline of the EEA long rains (Figure 2). Given the combination of current La Niña-like conditions, the pessimistic but skillful AdReg results shown here, and general tendency for EEA MAM rains to be below normal in the absence of strong forcing from El Niño or Indian Ocean Dipole-like conditions, assumptions of below normal rains for both the short and long rains may be warranted. The MAM outlook value would hover at the edge of the normal and below normal tercile boundary. Figure 9. Correlation between observed EEA MAM rains and NMME OND precipitation from the preceding October. Figure 10. AdReg forecasts for EEA MAM rains. Cross-validated results for 1982-2016, and the 2017 forecast. Bars denote 80% confidence intervals. Figure 11. Correlation between NMME OND Precipitation and PC1 for MAM EEA forecast. Figure 12. EEA October and OND rainfall, 1981-2016. Hoell, A., Funk, C., & Barlow, M. (2014). La Niña diversity and Northwest Indian Ocean Rim teleconnections. Climate Dynamics, 1-18. Funk, C and Hoell A. (2017) Recent Climate Extremes Associated with the West Pacific Warming Mode, AGU Monograph-Climate Extremes: Patterns and Mechanisms. Ed. by Simon Wang, Jin-Ho Yoon, Chris Funk and Robert Gillies, published by Wiley Press 226 (2017): 165. Liebmann B., Bladé I., Funk C., Allured D., Hoerling, M., Hoell, A., Peterson, P., Thiaw, M.T. (2017) Climatology and Interannual Variability of Boreal Spring Wet Season Precipitation in the Eastern Horn of Africa and Implications for its Recent Decline,J. Climate, Journal of Climate 30.10 (2017): 3867-3886. Effective drought prediction can be enhanced by a clear understanding of the drivers of drought. How we conceptualize climate change influences our ability to identify the fingerprints of change. Together with Simon Wang, Jin-Ho Yoon, and Robert R. Gillies, I have helped edit a new AGU book on ‘Climate Extremes: Patterns and Mechanisms’, examining how climate change may be bringing more extreme events. Recognizing these influences, can improve our ability to anticipate climate extremes. In the chapter I wrote for this book, I discuss how increases in the intensity of both the El Niño-Southern Oscillation (ENSO) and the West Pacific Warming Mode may be making both El Niño-like and La Niña-like extremes more severe. In 2015 and 2016, an anthropogenic enhancement of the 2014-16 El Niño event may have exacerbated the severe droughts that struck northern Ethiopia and Southern Africa. CHG scientists have a BAMS article examining this topic. In 2016 and 2017, extreme West Pacific warming likely contributed to the severe East African droughts that struck in October-November-December (2016) and March-April-May (2017), resulting in current near-famine conditions in Somalia (Figure 1) and eastern Ethiopia (Figure 2). Recent Famine Early Warning Systems Network (FEWS NET) reporting finds that in Somalia 2016 and 2017 harvests were very poor (~25% and ~50% of normal, respectively). In many areas of Eastern Ethiopia and Central Somalia, the twelve month June 2016-May 2017 rainfall was the lowest on record (since 1981). Many Pastoralists have lost more than 60% of their herds – a huge loss in livelihood and accumulated wealth. Both Ethiopia and Somalia suffer from outbreaks of cholera, with Somalia experiencing more than 50,000 cases since January 2017. The situation is dire, but would likely have been worse without humanitarian assistance. In Somalia, US humanitarian assistance doubled between December and January (from assistance for 0.5 to 1 million people), and then doubled again between January and February, reaching 2.4 million in June. While the distribution and quantity of aid could be increased, humanitarian relief is providing life-saving assistance to millions of people; current UN estimates indicate that food aid is reaching about 2.5 million people out of a targeted 3.3 million. An important corollary of this assistance is the stabilization of cereal prices. Between October of 2010 and May of 2011, the prices of red sorghum in the Somali city of Baidoa climbed by 300%. These price increases made it extremely difficult for poor households to purchase food, contributing to ~205,000 drought-related deaths between January and June of 2011 (link). In 2017, by comparison, sorghum prices in Bay increased by 70%, and mortality rates have not increased by the large amounts seen in 2011. Ethiopia and Somalia continue to face very dangerous near-famine levels of insecurity. Water supplies and rangeland conditions are likely to deteriorate as we enter the dry season (July-September). Levels of international assistance remain below the required levels. Nonetheless, timely assistance in 2017, guided by effective early warning, has helped millions of people. The region, however, will almost certainly continue to face severe water and fodder shortages, since the next likely chance of rain will not come until October. Here at the Climate Hazards Group, we believe that climate change is making sea surface temperatures more extreme, with hotter Eastern Pacific conditions during El Niños, and warmer Western Pacific conditions during La Niña-like time periods. We also believe that such extreme sea surface temperatures can provide opportunities for prediction. This approach led to our successful prediction of both the 2016 and 2017 East African droughts (Figure 3), as reported here on this blog. In our first posting, from October 9th, we noted that very warm Western Pacific and moderately cool Eastern Pacific sea surface temperatures would likely result in below normal October-November-December rains. This was expressed as a statistical forecast for dry (-1 standardized anomaly) conditions. We also noted that ‘we should be concerned about the possibility of two poor rainy seasons in the spring and fall of 2016’ in Eastern Kenya and Southern Somalia. In the next blog, on November 9th, we included October rainfall in our predictions, noting that Eastern Kenya and Southern Somalia October rains are very highly correlated (r=0.91) with October-November-December rainfall totals. Figure 3. List of CHG 2016/2017 blog results. In December of 2016 we turned our attention to the 2017 March-April-May season. Our concern was that we might see yet another drought, driven by a combination of persistently warm Western/Northern Pacific sea surface temperatures and cool La Niña-like Eastern Pacific conditions. A statistical model based on observed sea surface conditions performed well, predicting six out of seven of the most recent droughts using that model. We predicted a substantial (-1 standardized anomaly) East African drought. In December of 2016, East Pacific sea surface temperatures were near neutral, while Western/Northern Pacific sea surface temperatures were exceptionally hot. These conditions were quite different than in 2010 (the last severe drought) when both the West Pacific and East Pacific were cooler. In January and February we updated our forecasts, while also engaging in many discussions with our fellow early warning counterparts in the US, Europe and Africa. In January FEWS NET issued an alert suggesting that severe drought, rising prices, limited access and dry forecasts might produce famine in Somalia in 2017. The drought monitoring and climate predictions produced by the East African IGAD Climate Prediction and Applications Centre (ICPAC) during this time period were excellent and accurate; rapidly identifying the severe October-November-December dryness while also predicting below normal 2017 spring rains based on statistically recalibrated global climate model forecasts. In February of 2017, a joint alert was issued by FEWS NET, the World Food Programme, the European Commission, and the UN Food and Agriculture Organization identifying the elevated risk of Somali drought (based in part on a CHG forecast) and calling for ‘urgent and substantial’ provision of food aid and ‘resource mobilization to address the impact of an extended post-2016 lean season’. In late April of 2017 we analyzed empirical relationships between March-April rainfall and Somali ‘Gu’ sorghum harvests, suggesting that the data indicated that April was by far the most important month for grain filling, and predicting that 2017 ‘Gu’ harvests were going to be very poor (about 50% of normal) based on poor March-April 2017 rainfall. The 2016 and 2017 forecasts have verified. The 2016 and 2017 rainy seasons were poor. Vegetation/pasture were very heavily degraded, as predicted, and the 2017 Gu harvests were low, as we estimated using March-April rainfall observations. Can we resolve the East African Climate Change paradox? Figure 4. March-June rainfall anomalies in the eastern ‘Longcycle’ crop growing region of Ethiopia. FEWS NET climate change research began in 2003 when in the course of routine analysis we came across severe declines in annual precipitation in agriculturally productive and heavily populated regions of eastern Ethiopia. Figure 4 shows an updated time series of March-June rainfall for this region, through 2017. We see a severe decline in rainfall in a densely populated food insecure area; in the 20 years since 1998; only 5 years have been above normal, based on a 1900-2017 baseline. Our recent papers have also documented increased crop water stress, reduced soil moisture and stream runoff, and declines in vegetation. This drying is part of a wide-spread drying tendency associated with a strong Walker Circulation (a, b, c, d, e), which we believe is related to anthropogenic warming in the Indo-Pacific. The Walker Circulation is the world’s largest atmospheric circulation feature, and is made up of contrasting cells of ascending air and heavy rainfall near Indonesia and dry descending air over the Eastern Pacific and East Africa/Western Indian Ocean. Steve Baragona’s Voice of America story on the current East Africa drought (here) provides a great animation showing how the Walker circulation contributes to drying over East Africa. Pete Peterson has also produced a nice animation showing how increased rainfall near Indonesia is associated with declining East Africa precipitation (here). The relationship between climate change and the March-May East African ‘long’ rains has been a topic of considerable debate, largely because climate change models predict that East Africa should already be getting wetter, while observations show that it this region is drying, resulting in the ‘East African Climate Paradox’. This has engendered two basic explanations for the East African drought. According to the first explanation the climate models are wrong, and East African March-May drying is due to low frequency (anthropogenic) warming in the Western Pacific and Indian Ocean, probably exacerbated by natural La Niña-like climate tendencies. According to the second explanation, the models are right, and East African drying is primarily due to an extreme expression of natural decadal variability. Studies focused on observed rainfall (1, 2, 3, 4) and paleo-climate indicators (5, 6) tend to support hypothesis 1. These studies note that the CMIP climate change models fail to represent well the March-May rains (6) while also over-estimating El Niño-related sea surface temperature increases in the Eastern Pacific (7). We think that climate models are great, but not perfect. They have trouble representing (‘parameterizing’) the exceptionally complex processes associated with tropical precipitation, cloud formation and coupled ocean-atmosphere phenomena like the El Niño-Southern Oscillation. The models tend to overemphasize ENSO-related warming in the Eastern Pacific, leading, we believe to a spurious weakening of the Walker Circulation and increased precipitation over Eastern Africa during March-April-May. Here, we present a data-driven analysis based from a paper (link) that we have just submitted to the Quarterly Journal of the Royal Meteorological Society for a special issue focusing on the research of the International Precipitation Working Group. Figure 5. Composites of standardized March-May NOAA Extended Reconstruction sea surface temperature observations for East African drought years: 2011, 1984, 2000, 2009, 1999 and 2004. Anomalies based on a 1981-2010 baseline. Values screened for significance at p=0.1. We start by simply plotting global standardized March-May sea surface temperature anomalies during the six driest (1981-2016) eastern East African rainy seasons: 2011, 1984, 2000, 2009, 1999 and 2004. When eastern East Africa is dry, this region of the Western North Pacific tends to be very warm, and these warm sea surface temperature conditions are associated with circulation patterns that intensify the Walker Circulation (Figure 5E,F in link), increasing the Pacific trade winds, increasing rainfall near Indonesia, and bringing dry air down over Eastern Africa. In 2016 and 2017, we used the negative relationship between Western and Northern Pacific sea surface temperatures and East African rainfall to produce our successful forecasts. Figure 6 shows the relationship between standardized 1998-2017 East African March-May rainfall and rainfall estimates based on sea surface temperatures in the yellow box in Figure 5. While not a perfect predictor, this is a strong teleconnection that correctly predicts all the recent droughts. 2017 is shown with a red dot. Since Nino 3.4 sea surface temperature conditions were actually slightly positive (El Niño-like) in March-May of 2017 (usually associated with wetter than average conditions), the very warm Western North Pacific ocean conditions seem largely responsible for the 2017 East African drought. We refer to this region as a ‘longcycle’ crop growing area because it focuses on high cool areas of eastern Ethiopian highlands, where crop have a long growing cycle, but can produce much higher yields than quicker maturing ‘shortcycle’ varieties. Figure 7. Observed standardized March-May sea surface temperatures in the Western North Pacific (red) along with estimates of sea surface temperatures changes from a multi-model climate change ensemble (blue). Figure 7 shows a long time series of standardized March-May Western Pacific sea surface temperatures, along with the corresponding ensemble average standardized sea surface temperatures from a large (53 member) set of climate change simulations from the climate explorer. There is a strong relationship between climate change and sea surface temperatures that explains 40% of the season-to-season variance. The time series has a large (>+1 standardized anomaly) climate change influence, as well as a step-like increase after the 1997/98 El Niño, when East Africa transitioned to drier condi tions. Interestingly, we can see the cooling influence of the Agung, El Chichon, and Mount Pinatubo volcanic eruptions in 1965, 1982 and 1991-92. These dips indicate that radiation plays an important role in determining Western North Pacific Ocean temperatures. There is also an interannual El Niño influence, with Western North Pacific sea surface temperatures being cooler and warmer during El Niño and La Niña years. We often see recent El Niño events followed La Niña-like climate conditions and increases in West Pacific sea surface temperatures. The 1997/98, 2002/03, 2009/10, 2006/07 and 2015/16 El Niño events have all been followed by warm West Pacific sea surface temperature conditions. We then experienced East African droughts in 1999, 2000, 2001, 2004, 2008, 2009, 2011 and 2017. While more research on this is needed, it seems that El Niño events release energy from the lower ocean that ends up warming the Western Pacific, creating opportunities for prediction. The substantial post-1997 warming of the Western North Pacific (Figure 7) has been associated with a concomitant decline in East African March-May rainfall. Figure 8 shows 15-year averages of standardized eastern East African March-May rainfall (blue line) along the with regression estimates of eastern East African March-May rainfall based on 15-year averages of observed Western North Pacific sea surface temperatures (blue line) and Western North Pacific sea surface temperatures from a climate change ensemble (purple line) . Low frequency (15 year average) variations in March-May East African rainfall time series track closely (r=0.7) with estimates based on sea surface temperatures. As the Western North Pacific has warmed, the Walker Circulation has intensified and East African rainfall has declined substantially. Neither East African March-May rainfall nor Western North Pacific sea surface temperatures track closely with the Pacific Decadal Oscillation or smoothed El Niño (Eastern Pacific) sea surface temperatures (Fig. 4 in link). While natural decadal variability probably helped enhance East African precipitation in the 1980s and 1900s, the current substantial decline and low 2017 rainfall outcome appears largely due to anthropogenic warming of the Western North Pacific. Figure 8. 15-year averages of East Africa March-May rainfall (blue), and estimated East Africa rainfall based on observed 15-year Western North Pacific sea surface temperatures (red), and climate change simulations of Western North Pacific sea surface temperatures (purple). To resolve the East African Climate Paradox, I would suggest that we can explain most large scale sea surface temperature changes in the Pacific as arising from two patterns of climate variability – the El Niño-Southern Oscillation (ENSO) pattern and the ‘West Pacific Warming Mode’ pattern (JCLIM paper; Chapter in AGU Extremes Book). Both modes of variability are associated with warming, but in different places. ENSO-related warming appears in equatorial Eastern Pacific, associated with strong El Niño events. We have recently argued that anthropogenic warming enhanced the extreme 2015/16 El Niño event, increasing the severity of the 2015 and 2015/16 Ethiopian and Southern African droughts (here). Following El Niño events, we then tend to see large increases in Western Pacific sea surface temperatures, contributing to the 1999, 2000, 2001, 2004, 2008, 2009, 2011 and 2017 East African droughts. When we focus on how mean sea surface temperatures and precipitation averages are changing in the models, we find substantial discord. The models are predicting a shift towards an El Niño-like climate and increases in East African precipitation. When we instead focus on how sea surface temperature extremes, and associated precipitation anomalies, are changing in the climate change models, we find substantial consilience. Ironically, ensemble averages of climate change simulations may actually be more prone to biases. Small problems, like the tendency to overestimate the strength of El Niños (cf. Figure 3b JCLIM paper), may strongly influence the ensemble average. Focusing how the models represent extreme events may be more informative, especially in the context of drought early warning. Figure 9. Differences in Community Earth System Model March-May standardized precipitation for very warm versus warm Western North Pacific sea surface temperatures. The climate change models are predicting that we will experience both more extreme El Niño events and more extreme Western North Pacific events. We explore this in depth in our new paper. In this study, we examine a large (40 member) ensemble of climate change simulations from the Community Earth System Model, and explore the change in precipitation responses associated with very warm versus just warm Western North Pacific sea surface temperatures (Figure 9). The climate change models predict that we will experience more frequent very warm Western North Pacific sea surface temperature conditions (Figure 7), and that when these conditions arise we will see a stronger Walker circulation (more rainfall near Indonesia), and less rainfall over Eastern Africa and the southwestern Arabian peninsula (Figure 9). In conclusion, it seems likely that the recent increased frequency of East African March-May droughts are related to warmer Western Pacific sea surface temperatures (Figures 5, 6, 8 and 9), which have warmed substantially due to a combination of anthropogenic climate change and ENSO influences (Figure 7). These droughts appear to be largely predictable, and associated with severe human impacts which can be partially mitigated though humanitarian assistance. In Somalia in 2010/11, drought, political instability, violent conflict, and global food price volatility resulted in 258,000 deaths, with 133,000 of these deaths being children under five years old (link). In 2017, Somalia and eastern Ethiopia again face one of the most severe droughts on record (here). In Eastern Ethiopia millions of people of people face severe hunger. Herd sizes have been dramatically reduced; “households have few, if any, livestock to sell and … milk availability will remain very low in 2017”. Some 1.7 million people are estimated to be facing severe food shortages, associated with 20-50% caloric deficiencies. Unless food aid allocations are increased, caloric deficits may exceed 50%, and “poor households in the worst-affected pastoral areas will begin to move into Catastrophe (IPC Phase 5) and acute malnutrition and mortality may rise further” (FEWS NET alert, July 19th). In Somalia, the most recent assessments by the Food Security and Nutrition Analysis Unit – Somalia (FSNAU report) identify more than 50,000 cases of Acute Watery Diarrhea/Cholera, and very high levels of physical wasting among children in camps holding internally displaced persons (IDPs). July 2017 FSNAU estimates indicate that some 3.24 million people face crisis or emergency levels of food insecurity. Since February, emergency food aid assistance has been scaled up from aid for 1 million people to aid for 2.4 million in June of 2017. This assistance has helped, but more aid is needed, and access to humanitarian assistance in many areas in central and southern Somalia remains a challenge. Figure 10. Time series of March-May rainfall from eastern East Africa. While the food security crises in eastern Ethiopia and Somalia have been caused by many factors in addition to drought, the long term decline of the March-May East African long rains (Figure 10) has certainly contributed to food insecurity in this region. The 1900-2017 time series shown in Figure 10 has been produced by combining 1900-1980 Centennial Trends precipitation data with the 1981­­-2017 CHIRPS archive. Both of these data sets benefit from a high quality collection of rainfall gauge observations, and there is a high level of agreement between these observations during their period of overlap (1981-2014), with a correlation of 0.94. Figure 10 shows standardized March-May rainfall anomalies, with a value of -1 indicating a poor season. Of the nineteen years since 1999, eight seasons have been poor (1999, 2000, 2001, 2004, 2008, 2009, 2011 and 2017), and fourteen seasons have been below normal, based on a 1900-2017 baseline. These eight dry seasons have been associated with very warm Western North Pacific sea surface temperatures (Figure 6). Anthropogenic climate change has helped produce these warm sea surface temperature conditions (Figure 7). Estimating the influence of Western North Pacific warming on rainfall (Figure 9) indicates a strong negative (~-0.7 standardized anomalies) rainfall response, similar in magnitude to results from a previous experiment using the CAM5 atmospheric model (here). Anthropogenic climate change has likely contributed to the current March-May drought and the increased frequency of poor March-May rainfall outcomes. Many of these droughts, however, appear to be predictable. This post examines conditions across East Africa at the close of April. As predicted by the CHG, ICPAC, and a joint assessment by FEWS NET, WFP, FAO and JRC, exceptional warming in the West Pacific appears to have continued to produce subsidence and drying over East Africa. At present (Figure 1), the FEWS NET food security outlook for Eastern Africa is very concerning, with a June-September outlook calling for IPC phase 3 (crisis) or 4 (emergency) across Kenya, South Sudan, southern Ethiopia and Somalia. The FEWS NET perspective seems largely congruent with the most recent seasonal assessment by the World Food Programme (here). In Kenya, southern Ethiopia and Somalia June-September food security outcomes will be strongly influenced by rainfall in March and April, since most of the long rains tend to come in these months, and moist soils during this period support the establishment of healthy crops. As we will show below, poor March-April rainfall can be a good predictor of low crop production in Somalia. Figure 1. FEWS NET Food Security Outlook for June-September 2017. Orange and red shades denote crisis and emergency conditions. Black shading in South Sudan indicates famine. We begin by looking at the observed March to late April rainfall performance using NOAA CPC ARC2 and CHIRPS rainfall fields enhanced with data provided by FAO SWALIM and the National Meteorological Agency of Ethiopia. All evidence indicates poor rainfall performance for much of the Greater Horn of Africa. We then examine the relationship between Somali Gu Sorghum crop production statistics and March-May rainfall. We find that March-April rains are by far the most important – and current March-April totals indicate very poor sorghum production totals for 2017. We conclude with a brief look at the current climate conditions and the performance of the NOAA GEFS weather forecasts. March-April 24th ARC2 anomalies (Figure 2) and March-April 20th ‘enhanced’ CHIRPS data, expressed as standardized precipitation index values (Figure 3) are in strong agreement that there has been wide-spread drought across almost all of Kenya, Somalia and Uganda as well as southern Ethiopia, eastern South Sudan, north-central Tanzania and western Yemen. Note that the units in these maps are different. It is useful to consider rainfall anomalies both in terms of absolute magnitude (Figure 2) and as standardized anomalies (Figure 3). In Figure 2 we note very large (100 mm) rainfall deficits across central Kenya, Uganda and in the SNNPR region of Ethiopia; these large deficits could be associated with large disruptions in key crop growing areas. In Figure 3 we see that the seasonal rainfall progress has been exceptionally dry, in a statistical sense (<-1 standard deviations) across most of the Horn. In Somalia, where even normal rainfall totals are characteristically low, we find that our estimates indicate an exceptionally poor March-May season. While the results in Figure 2 do not indicate performance over the last dekad of April, CPC ARC2 totals for April 21, 22, 23 and 24 show almost no rainfall over Somalia. Figure 3. CHIRPS Standardized Precipitation Index values from March 1st-April 20th 2017. For Somalia, it is important to realize that we have been able to incorporate a fairly dense network of gauge observations provided by FAO SWALIM. Figure 4 shows April 1st to April 20th enhanced CHIRPS rainfall totals. The numbers on this map show rainfall totals from either the SWALIM stations or WMO GTS observations. Across all of East Africa, very few regions appear to have received more than 60 mm of rain so far in April. From a crop perspective, this means that planting has been delayed across Kenya and Somalia, and crop growth is likely to be running substantially behind normal. For example, ARC2 data at Meru, in central Kenya, indicates a seasonal accumulation of ~120 mm, less than half of the normal 270 mm. Results in Baidoa (Bay Region Somalia), Dif in far eastern Kenya, and Kibre Mengist in south-central Ethiopia are similar. Figure 4. Enhanced CHIRPS precipitation for April 1 to April 20, 2017. To examine likely outcomes for the total March-May season we have combined March 1 to April 20 CHIRPS rainfall totals and then examined the possible combinations of future rainfall by sequentially inserting one of the past 36 years (1981-2016) and then examining the associated distribution of seasonal rainfall totals. We begin by showing these results for the Bay Province of Somalia (Figure 5), which is currently facing food security crisis (i.e. just short of famine) conditions (see Figure 1). We start at a low seasonal total of 42 mm for Bay on April 20th – this low value and large deficit is primarily due to the low April rainfall totals, as shown in the SWALIM station data (Figure 4). To explore the remainder of the season, we sample the CHIRPS data using all prior seasons. Advancing one dekad by this approach gives us a seasonal total for the end of April of 90 mm, only 60% of long term average. As we will see below, this large March-April deficit will very likely be associated with large crop production deficits. Proceeding through the rest of May in this same fashion we arrive at a spread of possible outcomes ranging from near normal to very low, with an average outcome of 174 mm, 74% of the long term average. In the context of the past 20 years, this would be a 1-in-5 year drought (i.e. 20th percentile); 2011, 2001, 2008, and 1999 were a little drier. Figure 5. Cumulative rainfall ensemble for Bay region of Somalia. Observed CHIRPS dekads are used from February through April 20th. Repeating this process for each pixel, we can assess the probability of March-June rainfall being less than 85% of the long term average (Figure 6) and less than 50% of the long term average (Figure 7). Figure 6 indicates that the regional as a whole is very likely at this point to end with below normal rainfall. The certainty of this outcome is much less in northern East Africa, although some Belg growing regions in the eastern highlands of Ethiopia and the northernmost parts of Somalia and Yemen are shown to have an 80% chance of below normal rains. Across southern Somalia, southern Ethiopia, all of Kenya and much of Tanzania a below normal outcome seems almost certain, given historical rainfall distributions. Figure 6. Probability of March-May rainfall totals being below normal (less than 85% of average) based on historical rainfall distributions. Looking at areas likely to see catastrophic (<50% of normal) March-June outcomes, we see that such an outcome is very likely (>50% probability) across much of Kenya and near the Mandera triangle area at the intersection of Somalia, Ethiopia and Kenya. These are regions that have received low March-April 2017 rains (Figure 2 and 3) and have historically had short ‘long’ seasons – such that they now have low chances of anything but poor outcomes. We can see this in more detail by looking at cumulative rainfall totals for the Eastern (Figure 8) and Central (Figure 9) province of Kenya using the USGS Map Viewer. For Eastern province, seasonal rainfall totals have been extremely low (~140 mm), in line with 2010/11, and far below the typical seasonal total of ~310 mm. Historically, rainfall stops in this region at the end of April, hence we find a very high probability of very low rainfall (Figure 7). Figure 7. Probability of March-May rainfall totals being extremely low (less than 50% of average) based on historical rainfall distributions. For the densely populated, well observed Central Province of Kenya, we find that seasonal rainfall accumulations are the lowest in the 2001-2016 RFE2 period of record. The observed 257 mm is far below the average of 518 mm, and substantially lower than values in 2010-2011 at this time (330 mm). Figure 8. Cumulative RFE2 rainfall totals for the Eastern province of Kenya. Data from https://earlywarning.usgs.gov/fews/mapviewer/index.php?region=af. In many of these arid land regions current assessments of water hole conditions indicate alert or near-dry conditions – at or near the end of the rainy seasons – it is very likely that conditions will soon get worse in these locations as evaporation takes its toll on surface water stores. We next turn to Somalia’s Gu sorghum production outlook. This analysis is based on 1999-2016 Gu sorghum production for three key growing regions: Bay, Shabelle Dhexe and Shabelle Hoose. Our objective here is not to produce a precise crop production assessment for Somalia Gu production, but rather to highlight that the poor March-April rainfall totals, alone, are likely to produce serious reductions in crop production. Both the available production data and crop water requirement estimates from a simple crop model indicate that May rainfall will be unable to make up for the poor rainfall distribution in April. Both the crop production and CHIRPS rainfall data in Somalia are likely to be noisy. This analysis is intended to imply that a poor harvest is very likely – but not provide a precise quantitative Somali production forecast. We began by totaling sorghum production from Bay, Shabelle Dhexe and Shabelle Hoose and related these totals to CHIRPS rainfall from March-May, March-April, and May. We found an okay level of correspondence between crop production and March-May and March-April rainfall, with corresponding R2 values of 0.22 and 0.34. The correlation between sorghum production and May rainfall was actually weakly negative (-0.25), which helps explain why using March-April totals, rather than March-May totals, improved our predictive skill. The corresponding correlation between April rainfall and Gu sorghum production was fairly high (0.51). April is the key month for crops, according to the empirical data. To generate a prediction of Gu production in Southern Somalia we regressed (Figure 10) March-April rains in Bay, Shabelle Dhexe and Shabelle Hoose against observed production anomalies (based on a 1999-2016 baseline). We then extracted the average April 1-20 rainfall total from our enhanced CHIRPS data set (27 mm) and assumed 25 mm for the last dekad of April. This latter value was a compromise between the April 21-25 observed ARC2 outcome (~0 mm) and the optimistic weather forecasts (discussed further in the next section). These assumptions and our regression indicate very low March-April rainfall totals and corresponding very poor level of crop performance (-50%), similar to previous recent drought years. Figure 10. Scatterplot of southern Somalia sorghum production percent anomalies and March-April rainfall [mm]. The circle marked in red is the production estimate for 2017, based on March-April rainfall. To further corroborate these results we looked at the relationship between pixel-level Water Requirement Satisfaction Index (WRSI) end-of-season values and onset of rains dates for Bay (Figure 11). The WRSI is an index that shows crop water stress – a value of 100 means no water stress. Note that under normal conditions (with a start in the first or second dekad of April), Bay WRSI values are low (~50). This is a very marginal farming region. In the WRSI model the onset of rains triggers crop growth. It is calculated by identifying areas that receive at least 25 mm of rainfall in a dekad, followed by 20 more mm in the next 20 days. Since our enhanced CHIRPS data indicate average Bay rainfall totals of 12 and 15 mm for the first and second dekad of April, it seems unlikely that the region experienced onset conditions in those dekads. While this outcome was uncommon, we see a large decline in end-of-season WRSI. Our crop simulation results reinforce the critical nature of good early rains. Crops require weeks of decent rainfall to emerge, put on green vegetation and then divert resources to build up grains. Even if southern Somalia receives torrential rain in the next several weeks it seems unlikely that conditions will be conducive to rainfed agriculture. Figure 11. Distribution of end of season WRSI in Bay Somalia, stratified by onset date. Figure 12. GEFS 7 Day precipitation forecast [mm] April 25-May 2nd. We next briefly explore the skill of NOAA’s Global Ensemble Forecast System (GEFS) weather forecasts and discuss their current forecasts for the Horn. The issue we focus on here is the likelihood that current optimistic forecasts (Figure 12) for rainfall over Somalia will verify. These forecasts call for more than 80 mm of rain during the upcoming week. Such relief could definitely improve rangeland conditions and prospects for irrigated agriculture. CHG assessments of GEFS forecast skill (Figure 13) show some promising areas of high correlation, but not for the first half of May or the end of April. Thus while these forecast could prove accurate, the should probably be treated cautiously, since historically they have had fairly low correlations with observations over Somalia, and we have yet to see any rainfall totals approaching this magnitude appear across the region. On the other hand, it is certainly plausible that Somalia could see a few weeks of healthy rain before the season comes to a close. Such rains could improve rangeland conditions and water availability, but may not provide much relief to crop areas in Somalia. Based on the data analyzed here, reliable maps of observed rainfall (Figs. 2-4) provide a solid basis for predicting Gu agricultural outcomes, which look bleak for 2017. Central and Eastern Kenya and the Mandera triangle region also appear very likely to large precipitation deficits. Figure 13. Correlation between GEFS 2-week forecasts and CHIRPS data for different initialization dates. For Kenya, field reports indicate that the area planted with crops is less than 50% of normal in the southeastern lowlands. Central, eastern and coast Kenya has experienced a late onset of rains, only episodic precipitation, and a shortened growing season. At present, maize crops are only just emerging or are very young. Forecasts from the Kenya Met Department are for a normal ending time for the March-May season, suggesting that these crops are unlikely to have time to complete germination and grain filling. The poor March-May trends appear to be part of an ongoing drying trend (Figure 14) associated with warming in the Western Pacific. This trend has helped produce repetitive shocks, reducing household food security and resilience. Figure 14. March-May rainfall trends based on CHIRPS data enhanced with a dense network of Kenya Met Department observations. As an example, consider a time series of NDVI anomalies for the Coastal Province of Kenya (Figure 15). Since 2009, typical vegetation conditions have been below normal, with large drought events in 2009, 2010/11, 2012, and 2016/17. The current 2016/17 appears to be the worst event. Figure 15. USGS eMODIS NDVI anomalies from the Coastal Province of Kenya. Ethiopia experiences three climatic seasons, with high rainfall during two major rainy seasons. The country’s economy is largely agrarian, in which pure farming, mixed farming, and livestock herding (pastoralists) are common practice. Consistent increases in population, over-exploitation of natural resources such as natural forest and swampy lands for agriculture, and well as an alarming expansion of urbanization impose untenable burdens on Ethiopia’s social and economic strata. The agricultural sector in particular supports 85% of the population and thus is central to the livelihoods of the rural poor in Ethiopia (Conway et al. 2007; Deressa 2006). Current agricultural and herding practices in the country mainly rely on seasonal rainfall and water available in perennial rivers and dams; only a small fraction of Ethiopian agriculture is irrigated. A significant decline in annual agricultural production has been observed during drought years (Lemi 2005). It has been documented that food shortage and scarcity of water have led to local and nationwide famines, mainly due to complete or partial failures of short (Belg, February-May) and long (Kiremt, June-Sep) rainy seasons over various parts of Ethiopia (NMSA, 1996). The failure of seasonal rainfall is often caused by either misplacement or weakening of large-scale seasonal rain-producing systems. Stephanie et al. (2016) documented that droughts and famines, such as the socio-economic catastrophe of 2011, call attention to the need for reliable seasonal forecasts for rainfall in Ethiopia to allow for agricultural planning and drought preparations. Drought-related famine is the result of several factors, where lack of rainfall is only the first (Webb et al. 1992). Famine, in itself, cannot be taken as evidence of drought, while it is also not possible to assess the role of societal conditions without knowledge of the extremeness of rainfall deficits (Viste et al, 2013). To address this quandary, some scholars (Funk et al. 2008; Williams and Funk 2011) have documented rainfall declines in southern and eastern Ethiopia, especially in the spring season. Dry Belg seasons affect all of Ethiopia, causing the largest relative precipitation deficits in the south, where it is the main rainy season. The southern and southeastern lowlands have been drier than normal in every year from 1998 through 2010, with 2009 having the worst drought incidences. This description considers normal as being the average if rainfall over the years 1981-2010. For instance, Viste et al. (2013) noted that even though both the Belg and Kiremt seasons were dry in both 1984 and 2009, the large-scale patterns reflect the fact that in 1984 the Kiremt was one of the driest seasons, whereas the Belg was particularly dry in 2009. The core of the 2009 drought was located farther south, covering the Horn of Africa and the northern part of East Africa, where the February–May season is the main rainy season. While Kiremt is the main rainy season in many parts of Ethiopia, and Belg rains contribute about two-thirds of the annual rainfall for the southern and southeastern Ethiopia (Figure 1). For the Belg season, precipitation shows strong variability and is less reliable both from a temporal and spatial viewpoint, especially over the northern half of Ethiopia. The Belg rains start falling over southern Ethiopian in February. During a wet year, rain usually starts around mid-January and continues without prolonged dry spells through February over Belg growing regions as well as Belg rain-benefiting regions of Ethiopia (Figure 2). In March (Figure 3), Belg rains start to expand north and eastwards and cover the southwest to northeast regions of the Rift Valley. The western and eastern escarpment of the Rift Valley regions also receive rains. Much of the Southern Nations, Nationalities and People’s Region (SNNPR), the central and eastern half of Oromia, and the eastern Amhara regions usually receive more rainfall than other parts of the country. Belg rains reach their peak in April (Figure 4), particularly over the regions where Belg is the main rainy season as well as secondary rainy season (over south-southeast, central, east and northeast Ethiopia). Aside from those regions, Belg rains extend eastward and covers the Somali region, where Belg is the main rainy season. In many cases, severe droughts happen when April rains fall short of their predicted climatological values. May is the last month of Belg season (Figure 5), when rain starts to retreat/decline, slowing from eastern and southern sectors of Ethiopia. In contrast, Kiremt seasonal rains further expand west and northwards. Sometimes, Belg and Kiremt seasons merge during a fast transition from El Nino (Belg) to La Nina (Kiremt) or El Nino (Belg) to neutral (Kiremt) episodes. In Ethiopia, onset and cessation of seasonal rainfall vary considerably within a few kilometers distance due to altitudinal variations as well as orientation of mountain chains and their physical influence on atmospheric flow. In particular, diverse topography and strong seasonal variation over the country indicate the potential physical justifications to delineate rainfall patterns on various spatial scales. Based on existing evidence, rainfall seasonality, and above all by considering localized social and economic practices, we delineated the country into four homogeneous regimes. The characteristic of each homogeneous regime is mainly a reflection of their typical seasonal agro-climatic practices as well as the contribution and benefit of seasonal rainfall that prevails in each regime (Figure 6). Purple area (Regime I): This regime receives 40-70% of the total annual rainfall during February, March, April, and May, with rainfall maxima occurring from late March to mid-May), a variety of grain crops (maize, sorghum, teff, barley), root crops (potatoes), pasture, and water storage are commonly practiced over various portions of the region. Most parts of this region are identified as pastoralist. Green area (Regime II): Belg is the second rainy season and contributes 30-50% to annual rainfall totals. These regions usually receive less rainfall compared to southern Ethiopia despite the fact that they rely on Belg rains to produce short-cycled crops, root crops, land preparation for long-cycle crops, pasture, and water storage. Blue area (Regime III): This regime receives up to 30% of their annual rainfall totals from Belg rainfall. Belg rains usually fall from March and continue without prolonged dry spells up to October/mid-November. Belg rains especially contribute to land preparation, planting/sowing of long-cycle (18 dekads) crops (e.g., maize, sorghum), and to contribute for extension of long rainy season that usually spans from March to November. White area (Regime IV): Most parts of these regions receive less than 20% of annual rainfall totals from Belg rainfall because Kiremt is the major rainy season here, although it rains from mid-April/May to September/October. Up to the second dekad of April 2017 (to April 20th), the south eastern part of Ethiopia has received a low percentage of the expected rainfall. See Figure 7. Figure 7: Rainfall Percent anomalies (1st of February- 20th of April) for the 2017 season. On a regional level, we examined Regime 1 as shown on Figure 6. At the end of dekad 2 of April 2017, this region overall had received below average rainfall. Figure 8 shows the seasonal rainfall accumulation for the entire Regime 1 region. The black line shows how the overall rainfall for the region for the 2017 season deviates from the long term mean (thick red line). This season has received exceptionally low rainfall. The current total (~80 mm) is only 57% of the long term average (~140 mm). Only 3 out the 36 prior had lower seasonal totals, making this season a 10th percentile event – a one-in-ten-year drought if current conditions persist. Figure 8: Seasonal cumulative rainfall for Regime 1 for every year since 1981 to 2017. Black line represents the development of the 2017 season, red thick line shows the long term mean. The low rainfall during the season in Regime 1 translates into low soil moisture availability for plants. Figure 9 shows the WRSI for grasslands at the 2nd dekad of April. By this dekad only a few areas have received enough rainfall for the WRSI model to start. We have been monitoring polygon 1 in southern Ethiopia as shown in Figure 9. This polygon showed signs of stress, based on WRSI values, since the last dekad of March and exhibited no signs of recovery by the 2nd dekad of April. Figure 9: The WRSI model show that just a few areas have received enough rainfall to support grasslands and some of these areas are already showing stress, as shown in Polygon 1. Looking in more detail into Polygon 1, Figure 10 shows the seasonal cumulative rainfall for every year since 1981 using CHIRPS data. The black line represents the 2017 season, the thick red line shows the long term average, and the two black squares on the axis represent the 33rd and 67th percentiles. The plot shows that the season started as normal, but by the 1st dekad of March rainfall values started to decrease and have not recovered since. The current total (~120 mm) is only 60% of the long term average (~200 mm), and we see that this season’s total to date is also associated with a one-in-ten-year drought, if the current dryness continues. Figure 10: Spatially averaged seasonal cumulative rainfall for every year since 1981 for Polygon 1. Black line depicts the development of the 2017 season to the 2nd dekad of April. Figure 11 shows the ensemble of potential outcomes for Polygon 1 based on the observed cumulative rainfall to the 2nd dekad of April, completing the season with historical CHIRPS data for each year. The red line shows the long term average, the black squares show the 33rd and 67th percentiles of the historical data while the red dot is the average of the ensemble. The green triangles represent 1 standard deviation (+) or (-) from the ensemble’s average. The outlook table on Figure 11 shows the probability at the end of the season. This results indicates that there is a 94% probability that the seasonal accumulation for polygon1 is below normal. Looking at the ±1 standard deviation range shown in Figure 11, the likely outcomes range from near normal to extremely dry. The most likely outcome, described by the mean of the ensemble, is a total of about 270 mm, or 77% of the long term average. Low rainfall during the Belg 2017 season has been observed since the beginning of March. These low values in rainfall have been affecting the availability of water for crops and grasslands primarily in southern and southeastern Ethiopia. This analysis focuses on a specific area in southern Ethiopia where the conditions are getting worse as the season progresses. Even though there is more than a month to the end of the season, there is a 94% probability that the season ends below normal for this region. Substantial (75% of normal) rainfall deficits seem likely, and given the ensemble of historical outcomes, very low seasonal rainfall totals are quite possible. Conway, D., L. Schipper, M. Yesuf, M. Kassie, A. Persechino, A., B. Kebede (2007). Reducing vulnerability in Ethiopia: addressing the issues of climate change: Integration of results from Phase I. Norwich: Overseas Development Group, University of East Anglia. Deressa, T. T. (2006). Measuring the economic impact of climate change on Ethiopian agriculture: Ricardian approach. CEEPA Discussion Paper No. 21. Pretoria: University of Pretoria (http://econ.worldbank.org). Lemi, A. (2005). Rainfall probability and agricultural yield in Ethiopia. Eastern Africa Social Science Research Review, 21(1): 57-96. NMSA (1996), Climatic and agroclimatic resources of Ethiopia, Natl. Meteorol. Serv. Agency of Ethiopia, Meteorol. Res. Rep. Ser., 1(1), 1–137. Webb P, Braun Jv, Yohannes Y (1992). Famine in Ethiopia: policy implications of coping failure at national and household levels. Research Reports, vol 92. International Food Policy Research Institute, Washington, D.C.
As summarized in a recent UN Office for the Coordination of Human Affairs (UN OCHA) report, the drought and food security situation in East Africa is becoming increasingly fragile. Poor water access has helped lead to outbreaks of Acute Watery Diarrhea in Kenya, Somalia and Ethiopia, and cholera outbreaks in Somalia and Kenya. Two of the region’s biggest cereal exporters – Uganda and Tanzania face serious domestic challenges. In Uganda, thousands of immigrants continue to arrive from South Sudan, and fall armyworms may reduce Uganda’s four million metric ton maize output. According to UN OCHA, Ugandan maize prices have increased by 60%. Tanzania, typically the largest regional exporter has closed its borders for exports. Maize and bean prices have risen substantially in Kenya, but stabilized in Somalia in response to extensive humanitarian aid efforts. The FEWS NET March report for East Africa reports that “FEWS NET and FSNAU released joint statements on deteriorating food security in Somalia and the risk of Famine (IPC Phase 5) in a worst-case scenario in which the April to June 2017 Gu season performs very poorly, purchasing power declines to levels seen in 2010/11, and humanitarian assistance is unable to reach populations in need.” FEWS NET reports that there have been 10,571 cases of AWD/cholera since the beginning of 2017 – with half of these cases happening in Bay Province – which we focus on below. This report also identifies severe potential food insecurity in far eastern Ethiopia (Somali Region) and atypical levels of critical food insecurity across eastern and northern Kenya. More details for these countries can be found in the March reports for Somalia, Kenya, and Ethiopia. In general, these reports highlight high levels of concern for eastern Kenya, eastern Kenya, and southern Somalia, areas we believe likely to receive below normal March-May rainfall this year. As emphasized by the most recent NOAA Climate Prediction Center Weather Hazards report – “Erratic and below-average rainfall continues in East Africa”. Our objective with this posting is to a) highlight the severity of this drying over Eastern Kenya and Somalia, and b) emphasize the ongoing role that an overturning Walker Circulation intensification appears to be playing in supporting these arid conditions. We begin with a brief review of current vegetation and hydrologic conditions over East Africa. Poor October-December rains, warm temperatures, and low March precipitation totals in most areas have conspired to produce extensive vegetation stress across almost all of Kenya, southeastern Ethiopia, and Southern Somalia (Figure 1). Kenya appears to be hardest hit in terms of vegetation deficits. Figure 1.Current (March 21-31 2017) percent anomalies from EROS eMODIS vegetation imagery. Source: earlywarning.usgs.gov. following a poor 2016 short rainy season. Current water availability, based on estimates of water levels at water holes across arid regions of East Africa (Figure 2), also appears to be very low (near-dry) in most of the locations being monitored. Time series of water availability, which can be explored here, indicate many areas with zero water at present in many areas, with the water holes typically drying up between December and March. These same regions – Kenya, southeastern Ethiopia and Somalia – also appear as warm or very warm in Land Surface Temperature images (Figure 3). These warm conditions are likely due to a combination of surface water stress, low vegetation, lower than normal cloud cover and subsiding air, which increases local air temperatures. Figure 3. Standardized March 2014 MODIS Land Surface Temperature anomalies. Due to the severity of the current crisis, the CHG has created a first draft CHIRPS products for March that incorporates a large number of additional gauges provided by FAO/SWALIM and the Ethiopian Meteorological Agency. Sixty-two and forty-five additional gauges were provided, respectively, by our colleagues in Somalia and Ethiopia. While these gauge observations are routinely incorporated in the ‘final’ CHIRPS product, this final product is typically only available three weeks after the end of the month. Figure 4 presents a provisional CHIRPS rainfall for March, superimposed with station values. The station values are presented as colored squares, marked with source identifiers. What we see in this image is that the station data indicate that parts of Kenya and virtually all of Somalia received no rainfall in March. The background coloring shows the station-adjusted CHIRPS totals for March. These are very similar to the CPC ARC2 totals, except that the station data is more pessimistic over Southern Somalia. Both the ARC2 and satellite-only CHIRP estimates indicate about 25 mm of rain in some parts of this region. The station data, in contrast, indicate that extremely low rainfall totals are more likely. Note also that the gauge observations for typically rainy areas in western and central Kenya also exhibit very low rainfall. Figure 4. March CHIRPS precipitation totals overlain with station rainfall observations (shown as squares). Stations were kindly provided by FAO SWALIM and the Ethiopian Meteorological Agency. The stations shown for Kenya are provided by the Kenya Meteorological Agency via the Global Telecommunication System. We can also plot the March gauge and CHIRPS rainfall values as standardized anomalies (Figure 5). This map suggests that March has likely been much drier than normal over Somalia and parts of Kenya. While climatologically March is typically still quite dry in Somalia, the country appears to have received little relief in 2017. Figure 5. March 2017 CHIRPS and station observations expressed as standardized anomalies. Stations were kindly provided by FAO SWALIM and the Ethiopian Meteorological Agency. We next briefly place the current dryness in historic context for the Bay Region in Southern Somalia – an area facing severe IPC 4 (crisis) food security conditions (http://www.fews.net/east-africa/somalia). Figure 6. Potential cumulative rainfall curves for Bay Region, Somalia. To explore potential outcomes for the coming Gu season, we plot (Figure 6) the observed accumulated rainfall for the Bay region through the 1st dekad of April, and then simulate potential future seasonal performance by completing the season using observed CHIRPS rainfall from previous years. We assume that the SWALIM data correctly indicate zero March rainfall for this region. Furthermore, given that GTS observations and CPC ARC2 satellite estimates around this region report little rainfall over the last 7 days, we also assume that the rainfall in this region for the 1st 10 days of April will be 20 millimeters, about half the long term average value for this region and dekad. The result of these assumptions is that it appears likely that the Bay Region will receive below normal March-May rains, just based on the current seasonal deficit and historic rainfall outcomes. We next briefly focus on the Eastern Province of Kenya. Parts of this area are heavily populated, and it shows up consistently as an area of high vegetation stress (Figure 1), high temperature anomalies (Figure 3) and low rainfall totals (Figures 4 and 5). Time series (Figure 7) of vegetation (normalized difference vegetation index values) for Eastern Province appear to be very low, and lower than during the 2010/2011 drought period. Note however, that we are just entering the period when NDVI in this area is expected to increase. Figure 8 shows the corresponding cumulative rainfall totals, based on NOAA CPC RFE2 rainfall estimates. This plot indicates conditions similar to 2010/11. During March, this region typically receives about ~34 mm of rainfall (about a third of the typical ~170 mm March-May total). This year the amount received in March and early April appears to be much lower than that amount (~10 mm). Figure 7. Vegetation Health (NDVI) for Eastern Province of Kenya. Source: USGS Map Viewer. Figure 8. Cumulative NOAA CPC Rainfall totals for Eastern Kenya. We now examine recent climate conditions, which appear likely to be associated with continued rainfall suppression, despite the fact that La Niña climate conditions have dissipated over the past few months. What the most recent (April 3rd) NOAA CPC assessment shows is that equatorial Pacific sea surface temperatures (Figure 9) are currently exhibiting a ‘split personality’ with very warm temperatures in both the western and far eastern equatorial Pacific, and near neutral conditions in between, in the central Pacific. Since about July of 2016, we have seen relatively warm temperatures in the west Pacific and relatively cool temperatures in the central Pacific. This contrast in temperatures helps drive the Walker Circulation, producing enhanced rainfall near Indonesia and dry sinking air over eastern East Africa. We recently had a chance to discuss this with Steve Baragona, a science writer with Voice of America, who did a piece on the East African drought and climate change (link here). Steve was kind enough to share VOA’s animation describing the Walker Circulation’s impact on East Africa, which you can access here. When the western Pacific warms relative to the central Pacific, and rainfall increases around Indonesia and decreases in the central equatorial Pacific, rainfall tends to decrease across eastern East Africa. FEWS NET research has suggested that these changes can help explain a shift towards drier long/Gu/Belg rains over East Africa. To help visualize these changes you can see an animation we prepared here at the CHG. The basic idea behind this animation is that when the west Pacific warms relative to the east Pacific and precipitation around Indonesia increases, the East African long rains tend to decrease. This pattern helps explain the very dry March conditions and may persist into April and May. Figure 10 shows another plot from the recent CPC ENSO assessment. The top panel shows outgoing longwave radiation (OLR) anomalies for March. Since clouds block OLR, decreased OLR around Indonesia and increased OLR around the dateline (180°E) indicates an enhanced Walker Circulation, with more/less rainfall near Indonesia and the dateline. Between these areas of enhanced and reduced precipitation we find increased low level winds blowing into the area near Indonesia (Figure 10, bottom). These winds increase moisture convergence in that area while also acting to cool the central equatorial Pacific. Note that these OLR and wind responses are constrained to the western and central Pacific and are quite different than the typical ENSO response. This pattern appears similar to circulation anomalies associated with the West Pacific Warming Mode. This climate pattern is produced by a ‘Western V’ of warm sea surface temperatures beginning near Indonesia and stretching to the northeast and southeast – a pattern that appears very similar to sea surface temperature conditions in March of 2017 (Figure 11). This figure shows that March sea surface temperatures resemble a pattern commonly associated with drying over East Africa during March-June. This pattern could be exacerbated by La Niña conditions, but La Niña conditions are not necessary to produce dry East African rainfall outcomes. This ‘Western V’ pattern of warm sea surface temperatures enhances subsidence over the central Pacific, increases trade winds flowing into the region surrounding Indonesia, increases precipitation in that region, and decreases precipitation over Eastern East Africa. Figure 11. Standardized March 2017 sea surface temperature anomalies. Based on NOAA Extended Reconstruction version 4 data and a 1981-2010 baseline. This set of climate anomalies is occurring now and is likely to persist into April and possibly May. This far into the long/Gu/Belg season, monitoring the strength of the Walker Circulation can help us anticipate how the rest of the season may play out. Unfortunately, what we are seeing is that we continue to observe a large scale pattern of ascending and descending air that acts to enhance the Walker Circulation and reduce eastern East African rainfall. Figure 12 shows March 26th to April 4th vertical velocity anomalies averaged along the equator. Purple shades show areas of ascent, yellow-orange shades indicate sinking air. While the pattern of rising and sinking air for 2017 (top) does not look quite as intense as it did in 2011 (bottom), it still does not look conducive to good long rains in eastern East Africa. Figure 12. March 26th to April 4th vertical velocity anomalies. Source: NOAA Earth Systems Research Laboratory. We can look more closely at the surface wind component of the Walker Circulation enhancement (Figure 10, bottom), by extracting and plotting reanalysis surface winds from the central equatorial Pacific (Figure 13). Negative values in this time series indicate increased wind flow towards Indonesia. Note that this time series shows an abrupt change in 1999 – when East Africa switched to a ‘new normal’ associated with much drier East African March-May rains. In March of 2017, the intensity of these winds were similar to 1999, 2000, 2008, 2011 and 2012 – La Niña-like East African drought years. In April-May of these potential analog years Global Precipitation Climatology Project (GPCP) precipitation estimates (Figure 14) showed drying over East Africa and a Walker Circulation enhancement similar to that observed in March 2017 climate anomalies. Figure 13. Reanalysis east-west (zonal) winds over the equatorial central Pacific. Source: NOAA ESRL. Figure 14. Global Precipitation Climatology Project April-May rainfall anomalies for recent years with strong westward central Pacific winds in March. Source: NOAA ESRL. Our analysis of March rainfall anomalies and recent large scale climate fields compel continued concerns for the 2017 Long/Gu rainy season, especially over central-eastern Kenya and southern Somalia, where the season appears to have had a very poor start. Newly available station data, provided by FAO/SWALIM, allow us make this assertion for Somalia with an unprecedented level of confidence. This poor March onset of rains appears related to a La Niña-like atmospheric response pattern, despite the current ENSO-neutral conditions. FEWS NET research has linked such a response to a warm ‘Western V’ SST pattern, and this SST pattern seems likely to have contributed to poor March rainfall, and a probable below-normal March-May outcome, if current conditions persist, which seems likely. For Somalia, this could lead to a third failed or poor growing season. For most the Horn, a poor March-May season will exacerbate the current severe drought crisis. In early November of 2016 we predicted that eastern Kenya and southern Somalia would likely experience a very poor October-December short rainy season and one of the poorest combined March-May (Gu) + October-December (Deyr) seasons in the last 20 years. Unfortunately, the March 2017 report from the Somalia Food Security and Nutrition Unit (FSNAU) indicates (full report here) that agricultural conditions in Somalia tracked closely with our November outlook. The combined Gu/Deyr crop production levels were the worst on record, and the current 2016 local cereal supply situation is worse than in 2011 – when Somalia experienced a severe famine. Current humanitarian access, however, is much better than in 2011, and more than one million severely impacted people are receiving assistance in some of the most afflicted areas. Recent FEWS NET and FSNAU alerts, however, have also underscored the high food security impacts that could accompany a third poor 2017 March-May Gu season. Since December of 2016 this blog has maintained a negative outlook for the 2017 Gu season. Here, we update this assessment, based on the most up to date information available. We find that even though La Niña SST conditions have disappeared, a La Niña-like atmospheric response continues. Warm conditions in the Western Pacific continue to increase the chances of below normal rainfall in eastern East Africa. Before examining the data, however, it is worth considering the atmospheric conditions that, on average, keep eastern East Africa dry. Consider Figure 1, which shows February rainfall totals from the Climate Hazards Group Infrared Precipitation data set for South America, Africa and Indonesia. Why is eastern East Africa, an equatorial region located on the western rim of an ocean, so dry in comparison with the eastern seaboard of South America? The answer is the Walker Circulation. East Africa is dry because the very heavy rainfall around Indonesia, interacting with the Indian Monsoon winds, tends to produce dry warm sinking air over the eastern Horn of Africa. The Walker Circulation has three main centers of action – one region of very heavy rainfall, centered around Indonesia – an area with very warm sea surface temperatures, and two equatorial dry regions to the west (over eastern East Africa and the Indian Ocean) and to the east (over the eastern Equatorial Pacific). When the ocean around Indonesia is warmer than the equatorial East Pacific, we tend to see a La Niña-like climate response that brings warm dry air down over eastern East Africa, increasing the risk of drought. It is important to realize that we do not have to have a strong La Niña to have a severe East African March-May drought and La Niña-like atmospheric responses. For example, the signature 2011 drought was accompanied by mild (-0.5°C) La Niña conditions. Very dry conditions were also experienced in March-May of 2004 and 2009, years with neutral El Niño-Southern Oscillation conditions. These seasons, as well as ‘classic’ La Niña-type drought seasons in 1999, 2000 and 2008, share a common relationship – an enhanced Walker Circulation pattern contrasting increased moisture convergence, rainfall and ascending air near Indonesia with decreased moisture and dry descending air over eastern East Africa. Below, we analyze current climate conditions and suggest that persistence of the current Niña-like climate response appears likely, at least for the early part of the 2017 March-May growing season. While considerable uncertainty remains, a third poor or failed crop growing season for eastern Kenya and Somalia appears to be likely, with below normal March-May rainfall the most probable outcome. Even a late start to the rainfall in these regions could have very serious food security implications. The ‘long’ rains in these areas are actually quite short, and crops depend heavily on April precipitation. We present two lines of evidence converging on our below normal outlook: 1) a diagnostic analysis of current conditions and near-term weather forecasts, 2) a cross-validated statistical forecast based on the difference between March western Pacific and eastern Pacific sea surface temperatures (SSTs). Section 1 provides our diagnostic discussion. Section 2 provides our quantitative March-May forecast for a subset of eastern East Africa : a standardized rainfall outlook of -0.8Z, with an 80% confidence interval of -1.8Z to -0.2Z, and a 65% chance of below normal rainfall (rainfall less than -0.5Z). Figure 2. Past thirty day OLR and near-surface wind anomalies from the Climate Prediction Center’s March 20th ENSO discussion. Observed conditions and near-term weather forecasts indicate below normal rains. At this point (March 23rd), when the March-May rainy season typically commences in earnest, the observed climate conditions can be useful indicators of April rainfall performance. Are we seeing conditions indicating an intensification of the Walker Circulation and/or a reduction in the onshore moisture transports into northern Tanzania, Kenya and southern Somalia? The most recent (March 20th 2017) ENSO discussion from NOAA’s Climate Prediction Center identifies current neutral La Niña conditions. This same report, however, describes La Niña-like atmospheric responses, at least over the Indo-Pacific warm pool and eastern equatorial Pacific Ocean (near the dateline, 180°E/180°W). Looking at anomalies (differences from average) of Outgoing Longwave Radiation (OLR) data for the last thirty days (Figure 2), we see more OLR/less rainfall near the dateline and less OLR/more rainfall over the Warm Pool (110°E-150°E). OLR is blocked by clouds, so we see more cloudiness near the Maritime Continent and less cloudiness near the dateline — a modest enhancement of the Walker Circulation. Thus we are seeing a modestly La Niña-like atmospheric response despite neutral La Niña SST conditions. We are also seeing stronger near-surface trade winds along the equator between 160 and 180°E. These trade winds help bring moisture into the warm pool, feeding convergence and rising air near the Maritime Continent. This convergence and rising air can enhance the Walker Circulation and contribute to below normal rainfall over East Africa. Figure 3. A longitude-time plot of OLR anomalies from the Climate Prediction Center’s March 20th ENSO discussion. Figure 3 shows a longitude-time plot of OLR anomalies, also taken from the CPC ENSO assessment. The x-axis in this figure shows cloudiness anomalies (OLR) along the equator, with Africa and Indian Ocean being on the right, the Maritime Continent in Center, and the East Pacific on the right. Since early October we have seen a persistent pattern of cloudier conditions over the warm pool and less cloudier conditions over the dateline. This pattern helped produce the severe October-December drought over East Africa. There was a brief period of increased cloudiness and rainfall over East Africa in February. This respite was associated with the passage of a Madden-Julian Oscillation, and is not likely to extend into April. In March of 2017 we see a continued enhancement of the Walker Circulation, suggestive of a below normal outlook for April and perhaps May. At the bottom this panel (end of March) we see conditions similar October-November of 2016 – when the 2016 short/Deyr rains failed. Figure 4. March 11-20 2017 CHIRPS standardized precipitation anomalies. Recent rainfall conditions over East Africa have been dry, though we are still very early in the March-May season. Figure 4 shows the CHIRPS rainfall anomalies for March 11-20 2017, expressed as standardized anomalies (z-scores). Across northern Tanzania, Kenya, Somalia and Ethiopia we see widespread, modestly below normal precipitation. Note that the rains typically have not really started yet across most of this area. Using a different satellite (MODIS) we can also look at March 11-20 Land Surface Temperature (LST) anomalies (Figure 5). Again, we also see warm or very conditions across eastern East Africa. Later in this post we will suggest that dry sinking air (atmospheric subsidence) associated with a Walker Circulation enhancement may be contributing to these above normal temperatures. Figure 5. March 11-20 2017 MODIS Land Surface Temperature standardized anomalies. The next several figures (Figures 6-8) show March 11-20 2017 NCEP/NCAR reanalysis data provided by NOAA’s Earth System Research Laboratory (ESRL). We use these figures to explore current atmospheric conditions, looking for potential drivers related to the observed dry and warm conditions in the Horn of Africa (Figures 4 and 5) . Figure 6 shows March 11-20 2017 Total Precipitable Water anomalies. Blue areas in this image have less atmospheric water vapor. We see drier than normal conditions over east Africa where rainfall has been low (Figure 4) and LST has been warm (Figure 5). Not a great start to the rainy season. Figure 6. March 11-20 2017 Total Precipitable Water anomalies from the NCEP/NCAR Reanalysis. At this time of the year, we should be seeing low level moisture transports from the Indian Ocean blowing just north of Madagascar and into Tanzania, Kenya and southern Somalia . Instead, we are seeing that low level wind anomalies are heading the other way (Figure 7) at a pretty rapid rate (4-6 ms-1). This reduction in onshore moisture transports may be helping to reduce water vapor levels over East Africa (Figure 6). In this figure we also see anomalous winds over the equatorial eastern Indian and Central Pacific that feed enhanced moisture convergence near the Maritime Continent – enhancing the Walker Circulation. Figure 7. March 11-20 2017 Near-Surface Wind anomalies from the NCEP/NCAR Reanalysis. We conclude our analysis of reanalysis data by looking at a longitude-height plot of vertical velocities (Figure 8). Vertical velocities have been averaged along the equator and shown along the x-axis. Orange-red values in this plot indicate sinking air. Purple-blue shades denote rapidly ascending air. The y-axis represents elevation, with the top of the plot representing the top of the atmosphere. What we see in this figure is enhanced upward vertical motions near Indonesia (130-160°E) and enhanced downward motions over the western Indian Ocean and eastern East Africa (45-60°E). This subsidence may help explain the above normal temperatures we see in satellite data (Figure 5). Figure 8. March 11-20 2017 vertical velocity anomalies from the NCEP/NCAR Reanalysis. These reanalysis images just examine a brief ten-day snapshot of the climate, but do seem to indicate troubling patterns as we enter a critical growing season for Somalia. We can look out a little further out using Global Forecast System weather forecasts provided by NOAA’s Climate Prediction Center (CPC). Figure 9 shows the CPC’s March 31st-April 6th low level wind forecast. This appears similar to Figure 7, suggesting that continued reductions in onshore moisture flows may be likely, at least for early April. Once again we find large (4-5 ms-1) changes in wind speeds just off the coast of East Africa. Figure 9. CPC low level wind anomalies forecast for March 31-April 6th 2017. Image obtained from the CPC African desk. Here at the Climate Hazards Group, funding provided by NASA SERVIR is allowing us (Marty Landsfeld and Pete Peterson) to develop CHIRPS-compatible downscaled GEFS precipitation forecasts. Figure 10 shows these forecasts for the last 11 days of March. Drought stricken areas of southern Somalia are not forecast to receive any relief in March. This may indicate that continued dry warm conditions are likely for the start of the growing season. Figure 10. Downscaled (CHIRPS compatible) GFS rainfall forecast for March 21-31 2017. The area outlined in red will be examined in our forecast section. We now present statistical March-May rainfall forecasts for the region identified in red in Figure 10. This area was selected because i) it received poor rainfall in October-December of 2016, and ii) prior research by FEWS NET scientists have linked March-May rainfall in this region to SSTs in the western Pacific and central Pacific. We will use these SSTs to predict March-May rainfall. Figure 11. Correlation between 1997-20116 March NOAA Optimum Interpolation SSTs and March-May CHIRPS rainfall in eastern East Africa region shown in Figure 10. Purple boxes identify the equatorial western and central Pacific regions. Figure 11 shows the correlation between March-May eastern East African rainfall and March SSTs. When the western Pacific is relatively warm and the central Pacific is relatively cool in March, precipitation in our study site tends to be below normal. Figure 12. March 1 to March 23rd NOAA Optimum Interpolation SSTs, expressed as standardized anomalies based on a 1981-2010 baseline. Purple boxes identify the equatorial western and central Pacific regions. Figure 12 shows the observed March 1 to March 23 SSTs, expressed as standardized anomalies. We will use these SSTs to represent the month of March and derive a March-May rainfall forecast. In these observations we find a strong difference between western Pacific and central Pacific SSTs – with relatively warm West Pacific and relatively cool central Pacific conditions. While the West Pacific has cooled in over the last few months, and we may be heading toward potential El Niño conditions later this year, moderate gradient conditions still persist in March. These conditions appear consistent with the observed Walker Circulation enhancement discussed in Figures 6-8. In Figure 12 we also find a very strong pattern of warm and cold SST anomalies across the southern Indian Ocean. To the southeast of Madagascar we find very warm ocean conditions. To the northeast of this warm region we find very cool anomalies. This pattern appears associated with an anomalous sea level pressure gradient with low pressures in the southwestern Indian Ocean and higher pressures in the southwestern Indian Ocean. The sea level pressure gradients associated with these SSTs may be helping to drive the observed (Figure 7) and predicted (Figure 9) anomalous wind patterns just of the coast of East Africa, contributing to below normal moisture levels over East Africa (Figure 6). Figure 13. Standardized difference between West Pacific and Central Pacific SST time series. FEWS NET scientists have published numerous papers linking the gradient between West Pacific and Central Pacific SSTs to dry East Africa conditions during March-May. Figure 13 shows these standardized March SSTs differences from 1982 through 2017. The strength of this gradient has increased after 1998 as the West Pacific warmed dramatically and we experienced relatively frequent La Niña conditions. While the western-versus-central Pacific SST difference has weakened substantially over the past few months, as the West Pacific has cooled and the Central Pacific warmed, conditions in March 2017 still appear relatively unfavorable for eastern East Africa, with a standardized SST difference of +1Z. This gradient value is similar to 2012 and 2004, but substantially lower than strong drought years like 2000, 2008 or 2011 – when we also faced La Niña conditions in the eastern Pacific. On the other hand, unlike 2011, we are facing the prospect of three poor Somali rainy seasons. Crop simulations for East Africa indicate that most seasons in Somali poor fairly, so even mediocre 2017 rainfall could lead to poor crop production. The SST difference time series shown in Figure 13 is fairly well correlated with 1997-2016 March-May rainfall over eastern East Africa (R=-0.7). We can use this relationship to make statistical forecasts of March-May rainfall based on observed March SSTs. Our paper on this topic is available here. To test this forecast strategy, we use take-one-away cross validation. We remove each year of data, re-estimate our regression coefficients, and compare our forecast results with the removed value. Figure 14 shows our cross-validated forecast results, along with our 2017 forecast (-0.8Z). Overall the cross-validated R2 is relatively low (R2=0.33), but all the recent droughts are forecast to be below normal – we have a good ‘hit rate’. One very wet year (2013) was predicted to be dry. The cross-validated standard error was 0.8Z, resulting in 80% confidence intervals of -1.8Z to -0.2Z, and a 65% chance of below normal rainfall (rainfall less than -0.5Z). Figure 14. Standardized difference between West Pacific and Central Pacific SST time series. In conclusion, both our statistical forecast analysis and our review of recent climate diagnostics and weather forecasts indicate that below normal rains for eastern East Africa are likely. This may be especially true for the first part of the growing season. At present, observed east African moisture levels, precipitation, and land surface temperatures appear drier and hotter than usual. Warm SSTs to the east of Madagascar and Indonesia, combined with relatively cool SSTs in the southeast Indian Ocean and central Pacific, appear to be enhancing the Walker Circulation and increasing subsidence over East Africa (Figure 8), while also reducing onshore moisture transports into East Africa (Figure 6, 7 and 9). It seems probable that these conditions will persist into April, contributing to below normal March-May rains in at least parts of eastern East Africa. This pessimistic outlook is corroborated by our statistical forecast. This forecast indicates a substantial tilt in the odds towards below normal precipitation. While conditions may change rapidly if we transition into an El Niño-like climate state, a poor start to the March-May growing seasons in Southern Somalia and Eastern Kenya seems likely, and a third poor Somali growing season appears probable as well. Please note that this outlook does not cover northern Somalia or most of Ethiopia. Here we present yet another statistical forecast for below normal East African March-May rains. As predicted, October-December East African rainfall was below normal – in fact extreme dryness was experienced in Somalia, and the Somaliland area of Ethiopia (WFP, FEWS NET). At a global scale, the world faces unprecedented emergency food assistance needs, with four countries – Nigeria, South Sudan and Yemen facing a credible risk of famine. For Somalia, the Inter-Agency Working Group on Disaster Preparedness for East and Central Africa has released an urgent call for action, and the Somalia Food Security and Nutrition Analysis Unit warns of possible famine in Somalia. The FSNAU-FEWS NET countrywide seasonal assessment conducted in December 2016 and made public on February 2nd finds that 2.9 million people will likely face Crisis and Emergency (IPC Phases 3 and 4) through June 2017. To help identify drought conditions associated with protracted stress on livestock, the FEWS NET science team has analyzed six-month (July-December) soil moisture estimates (Figure 1). These estimates were produced at NASA using the Noah land surface model, CHIRPS precipitation, and MERRA2 surface forcings (air temperature, etc.). The outputs suggest that conditions in parts of coastal Kenya, Somalia and the Somaliland region of Ethiopia are among the driest on record (over the 1982-2016 time period), and as bad or worse than 2010. The failed 2010 season was the beginning of famine that killed more than 250,000 Somalis; half of these were young children . Looking at soil moisture, as opposed to just rainfall, sparse rainfall (a, b, c). Figure 2. Time series of standardized July-December Somalia soil moisture for the region highlighted in Figure 1. Extracting and plotting (Figure 2) standardized soil moisture values from region identified with blue polygon in Figure 1 (basically Somalia plus far-eastern Ethiopia), we can see that for this large area, the past six months have been the driest since 1982, due to the combined influence of low rainfall above normal temperatures. We will focus on forecasts for this region. We now turn to forecasting the March-May 2017 Gu rains, based on January 2017 NOAA optimum interpolation sea surface temperatures. This posting will be broadly similar to the last several outlooks. The process of predicting East African long rains based on observed January sea surface temperatures has been examined specifically by FEWS NET scientists to provide support for food security situations like we currently face in the Horn of Africa. The results presented here, however, focus on Gu rains in the Somalia region shown in Figure 1. For continuity with our previous blog posts, we also focus on seasons with cool or neutral central equatorial Pacific sea surface temperatures (1984, 1986, 1989, 1990, 1996, 1997, 1999, 2000, 2008, 2009, 2011, and 2012). These were years identified in our December 5th post, based on Niño 4 sea surface temperatures. In this study we use these years to calculate correlations and build a simple regression-based forecast. Figure 3. Correlation between Somalia Gu rainfall and January sea surface temperatures. Correlations screened for significance at p=0.1. Figure 3 shows the correlation between March-May Gu rains in our study region (Somalia) and January sea surface temperatures for years with cool or neutral central equatorial Pacific sea surface temperatures. Pink boxes denote regions selected as predictors: the West Pacific, Central Pacific, and South Pacific. In our previous forecast we selected the North Pacific, as opposed to South Pacific as a predictor. That forecast was based on different region and time-period. Dark yellow lines also mark the characteristic ‘Western V’ structure often associated with recent East African long rains droughts. The Western and Southern Pacific regions appear to be the strongest controls of the Somalia Gu season during years with neutral or cold central Pacific temperatures. As discussed in the Appendix below warm ocean conditions in these boxes help drive subsidence over the central Pacific and Indian Ocean. As second negative teleconnection region appears to the southeast of Madagascar. Warm ocean conditions here may slow the northward progression of the long rains. This region was not selected as a predictor, because the influence of this region has not been investigated in depth. Figure 4. Observed January NOAA Optimum Interpolation sea surface temperatures, expressed as standardized departures from a 1981-2010 baseline. Figure 4 shows the actual observed January 2017 sea surface temperature conditions. Very warm (+1.5 standardized anomalies) sea surface temperatures are found in the Western V regions. This ‘Western V’ pattern associated with the West Pacific Warming Mode produces dry conditions over East Africa. Slightly cool conditions are found in the Central Pacific. Note that very warm temperatures are also found to the southeast of Madagascar. Figures 5-7 show scatterplots for each of the individual predictor regions for years with neutral or cool central equatorial Pacific sea surface temperatures. Based on the individual Western Pacific and Southern Pacific predictors, the upcoming Gu season might be very dry (<-1Z). Based on the Central Pacific alone, Gu conditions might be near normal. Figure 5. Scatterplot of West Pacific January sea surface temperatures and March-May Somalia rainfall. Star indicates associated prediction for 2017. Figure 6. Scatterplot of South Pacific January sea surface temperatures and March-May Somalia rainfall. Star indicates associated prediction for 2017. Figure 7. Scatterplot of Central Pacific January sea surface temperatures and March-May Somalia rainfall. Star indicates associated prediction for 2017. We next combine our predictors in a multivariate cross-validated regression (Figure 8). Given the small number of degrees of freedom two predictors were used: the average of the west and south Pacific boxes, and the east Pacific sea surface temperatures. The regression slope indicated a stronger forcing for the average of the west and south Pacific boxes: -2.2Z per °C versus +0.6Z per °C. Each green circle shows one cross-validated hindcast estimate. In general the model does a good job identifying most drought years. When the model predicted below normal rains, below normal rains typically occurred (5 out of 8 times). The direct regression forecast from our model was very low (-1.3Z) – and we feel it is hard to justify such a negative outlook given the anticipated transition out of La Niña-like conditions. A more cautious approach is taken, in which we assume that all the years with below normal forecasts are reasonable analogs. We then use the mean of the observed rainfall for these years as our forecast (-0.8Z) and the standard deviation of these below normal forecast years as our standard error estimate. Our forecast and 80% confidence intervals are shown with a red circle and cross-hatch in Figure 8. The distribution associated with this forecast would indicate an 80% chance of below normal (<0Z) rainfall and a 20% of above normal (>+0Z). There would a 50% chance of poor or very poor rains (<-0.8Z). Figure 8. Cross-validated Somalia Gu hindcasts (green circles) based on January sea surface temperatures. Red star indicates 2017 Gu forecast and 80% confidence intervals (-0.8Z±1.1Z). Figure 9 summarizes our results. Somalia Gu rains have experienced a substantial decline. During seasons with neutral and cool Central Pacific sea surface temperatures (marked with stars), ‘Western V’-like sea surface temperatures in January (Figure 3) tend to be followed by below normal Gu rains. Not every drought fits this pattern (1991, 2005), but the evidence analyzed suggests that below normal rains for 2017 are likely. Since 1999, 12 out the last 18 Gu seasons have been below normal (<0), our model suggests that current Pacific sea surface temperatures resemble the conditions preceding many of these below normal years. Figure 9. Time series of standardized Somalia Gu rainfall (bars). Stars mark prior seasons with cool or neutral central Pacific sea surface temperatures. Black circles and lines indicate 2017 prediction (-0.8Z±1.1Z). It should also be noted, however, that some dynamic forecast models predict a transition out of La Niña-like conditions before June of 2017. Sea surface temperature conditions could change dramatically over the next three months. A poor start to the rainy season, followed by improved conditions might be associated with a transition to warmer temperatures in the eastern Pacific. At present, (Fig. 10) January rainfall anomalies continue to indicate strong subsidence over East Africa and the Indian Ocean. This pattern seems likely to persist. Fig. 10. January 2017 CHIRP rainfall anomalies (Source USGS/Climate Hazards Group/USGS). This technical appendix looks briefly at current (past 30 day) climate conditions associated with current (January) sea surface temperatures. It is not intended for a general audience. On the other hand, understanding what is driving the current climate state provides support for our statistical projection. We are currently seeing a strong dipole in the amount of water vapor over East Africa and the Indian Ocean versus the Indo-Pacific Warm Pool. We also find low water vapor totals along the equator near the dateline. Our statistical model essentially predicts a continuation of this pattern for the Gu season. Associated with this dipole are strong equatorial westerly low level wind anomalies over the equatorial Indian Ocean – advecting atmospheric moisture away from East Africa and towards Indonesia. At the dateline we also see easterly zonal anomalies. This is characteristic of mild La Niña-like conditions, but the rest of the eastern equatorial Pacific looks non-La Niña-like. Presumably these wind anomalies and water vapor conditions are associated with the observed January sea surface temperature conditions (Figure 4). The effect of warm sea surface temperatures in the equatorial West Pacific is well understood – warm tropical waters produce warm atmospheric conditions associated with low pressure, which can help draw in low level winds. More interesting might be the role played by warm south Pacific temperatures. Climatologically, upper level winds to the northeast of New Zealand move from west to east, curving north towards the equator to meet similar southerly flows from north of the equator. These converging flows produce upper level convergence and subsidence, reducing precipitation over the central Pacific. This helps to define the structure of the Walker Circulation. Over the past 30 days the upper level wind anomalies exhibit upper level ridging to the northeast of New Zealand and northwest of Hawaii that has enhanced north-south winds that converge near equator and dateline. We conjecture that this upper level riding is associated with a barotropic response to the very warm sea surface temperatures to the northeast of New Zealand and northwest of Hawaii. We can look at upper level velocity potential anomalies to see how this might associated with changes in the Walker Circulation. Purple areas in this figure are associated with upper divergence. Red regions are associated with upper level convergence. Upper level convergence will associated with subsidence and reduced precipitation, and this is what we see over Somalia and the central Pacific. We might interpret our statistical model to suggest that if temperatures in the West Pacific and South Pacific predictor regions remain substantially warmer than those over the central Pacific, atmospheric conditions will likely continue to exhibit the dry East Africa Indian Ocean/Wet Warm Pool/Dry Central Pacific pattern that has dominated the past four-to-five months. This posting will briefly review some aspects of 2016 climate and update our outlook for the 2017 March-June long rains (we remain pessimistic, although the outlook has improved somewhat). 2016 appears very likely to be the hottest year on record. Figure 1 shows annual NASA GISS global air temperature anomalies. The last point (2016) is based on January-November anomalies, since December data are not yet available. It seems that the massive 2015/16 El Niño helped release heat from the sub-surface of the ocean, resulting in the 2016 global air temperature anomaly (~+1°C) being substantially warmer than the previous 2001-2010 average (~+0.6°C). Ed Hawkins provides a very compelling representation o this warming spiral here. NASA also has a compelling new animation of OCO-2 satellite-based CO2 observations. Figure 1. NASA GISS global air temperature anomalies. Will this warming continue as a step up to a new ~+1°C ‘normal’ or will we return to more modest conditions in 2017? We will have to wait and see. What we do know, however, is that warming is already influencing food security. Somini Sengupta’s New York Times article discusses how ‘heat, hunger and war are forcing African’s onto a road on fire’, helping to fuel a dangerous and difficult increase in migration in the Sahel. Grace et al.’s 2015 paper identifies strong direct links between warming air temperatures and increased frequencies of low birthweight babies in Africa; very warm air temperatures can have direct negative impacts on mothers and infants. Warming likely increases risks of civil war in Africa and has non-linear negative impacts on economic production. Recent FEWS NET research, however, has also highlighted another important way that global warming affects food security – by increasing the warmth of local Indo-Pacific sea surface temperatures. ‘Local’ in this sense means that we are seeing global warming manifest as localized pockets of very warm sea surface temperatures. This has important implications for climate prediction and drought early warning. Pockets of localized very warm sea surface temperatures can enhance both El Niño-like and La Niña-like climate patterns. To illustrate this, we have prepared the following animation based on standardized January-February-March sea surface temperature from a single climate change simulation produced using the Canadian Earth System Model version 2, obtained from the Climate Explorer. The animation shows 1980-2030 sea surface temperatures, expressed as standardized anomalies from the 1961-1990 mean, with exceptionally warm (p<2.5%) regions identified with contours. The stretch in the image coloring goes from -2.5 to +2.5 standardized deviations. The point here is that as we enter the 21st century, we see pockets of very warm sea surface temperatures. Some of these anomalies look like El Niños, with warm conditions in the eastern Pacific. Some of these anomalies look like the West Pacific Warming Mode, with enhanced sea surface temperatures in the western Pacific and eastern Indian Ocean. Some look like the first half of 2016 (El Nino). Some look like conditions in October-November-December of 2016 (La Nina plus West Pacific Warming Mode). Our animation of a single climate change simulation can be compared to a much less extreme animation based on the average of a large multi-model ensemble, also obtained from the Climate Explorer. The stretch and contouring here is the same as in the individual model. In this view of climate change, we tend to see a fairly even warming of the global oceans, and relatively few dramatic regions of warming until the 2020s. This animation provides a valuable assessment of how climate change may influence the oceans, on average, but this multi-model ‘average’ will not be what we will experience in any giver year. Rather, what we will experience will be sea surface temperature variations that resemble a single climate change simulation (i.e. like this animation) – which seems likely to produce stronger El Niño-like and La Niña-like climate conditions. 2015 and 2016 may, unfortunately, have provided us with examples of such El Niño-like and La Niña-like variations. During 2015, as successfully predicted by global climate models and NOAA, we saw the onset of an exceptionally strong El Niño that helped produce severe droughts in Ethiopia, Southern Africa, and many other regions. Our article in the Bulletin of the American Meteorological Society’s (BAMS) annual climate attribution issue makes the case for anthropogenic enhancement of the 2016/16 El Niño to increased aridity and reduced runoff in Ethiopia and Southern Africa. In Southern Africa, current FEWS NET assessments indicate that the ‘worst affected areas of Zimbabwe and southern Somalia are expected to be in Emergency (IPC Phase 4) acute food insecurity during the lean season’, while ‘areas of Southern Madagascar are in Crisis (IPC Phase 3) during the lean season as households face larger gaps in their basic food needs’. Other chapters of the BAMS special issue find increases in heat, humidity, dryness, drought, cyclones, wildfires and tidal floods, and decreases in arctic sea ice and cold in the northeastern United States. During the summer of 2016 we experienced a rapid transition from El Niño to La Niña-like conditions. The west Pacific and eastern Indian Ocean warmed dramatically while the the eastern equatorial Pacific cooled. These conditions formed the basis of our accurate forecast for below normal East African October-November-December rains. Recent FEWS NET assessments document these very poor rains in Somalia, Eastern Kenya and Southeastern Ethiopia and describe the related high levels of food insecurity – ‘Emergency (IPC Phase 4) is likely in some areas of Somalia, and among some households in Ethiopia, while Crisis is expected for other areas of Somalia, southeastern Ethiopia, and northeastern Kenya through May 2017.’ Current FEWS NET reports identify Crisis conditions in northern Somalia, and vegetation conditions there look very poor (Figure 2), with current conditions very similar to 2010. If East Africa experiences poor 20 17 long (March-June) rains, food security in parts of Somalia, Ethiopia and Eastern Kenya are likely to deteriorate further, potentially resulting in conditions similar to 2010/11, which saw severe food emergencies in Kenya and Ethiopia and famine conditions in Somalia. The rest of this blog posting provides an outlook for the 2017 March-May long rains. Figure 2. eMODIS NDVI for northern Somalia. Image obtained from earlywarning.usgs.gov. This section of our blog updates the forecast we provided in December, using November-December and just December sea surface temperatures, as opposed to the October-November December sea surface temperature data we used last month. For brevity, we do not recreate all the analysis provided last month, but merely update our results. Before presenting our statistical forecast, we briefly review current conditions, based on the anomalies for last 30 days from NCEP/NCAR reanalysis data, provided by NOAA’s Earth System Research Laboratory. Figure 3 shows the past 30 day near-surface wind anomalies. Figure 4 shows anomalies of precipitable water (the total amount of water vapor in the atmosphere). Over the Indian Ocean and central Pacific the wind anomalies (Figure 3) continue to show a strong equatorial pattern associated with increased moisture convergence over the Indo-Pacific Warm Pool and decreased precipitable water over Eastern Africa (Figure 4). Over the eastern Indian Ocean the wind anomalies are very large (~7 ms-1). Over the western Indian Ocean and eastern East Africa we also find large (~-7 kgm-2) reductions in total precipitable water. CHIRP and NASA TMPA precipitation data (not shown) also show this strong dipole between East Africa/Western Indian Ocean and the Warm Pool region. Figure 3. Near surface wind anomalies for the past 30 days. Figure 4. Total precipitable water anomalies for the past 30 days. We next examine the sea surface temperatures associated with this anomalous circulation. We use both November-December and December surface temperatures to highlight possible changes in climate conditions, since the Climate Prediction Center anticipates a transition towards ENSO-neutral conditions by early February. Figure 5 shows both November-December and December NOAA Extended Reconstruction sea surface temperature anomalies, expressed as standardized deviations from a 1981-2010 baseline. Both November-December and December exhibit very warm conditions in the warm pool and extra-tropics, with a characteristic ‘western V’ pattern combined with modestly cool central Pacific anomalies. This pattern appears to be driving the anomalous winds and moisture conditions shown in Figures 3 and 4. Figure 5. November-December and December sea surface temperature anomalies. This sea surface temperature pattern is similar to the West Pacific Warming Mode. Figure 6 shows a time series of West Pacific Warming Mode index values, based on November-December data. What we see is that recent El Niño events are often followed by periods of high West Pacific Warming Mode index values, with current October-November West Pacific Warming Mode conditions similar to 2010. Figure 6. Time series of West Pacific Warm Mode index values. Vertical black lines denote recent El Nino events. As presented last month, we next examine (Figure 7) a scatterplot of the average November-December Warm Pool and North Pacific sea surface temperatures versus central Pacific sea surface temperatures. This analysis is shown for neutral and cool ENSO seasons. 2016 is shown with a red circle. The current conditions are pretty unique. What we see is a combination of very warm Warm Pool/North Pacific sea surface temperatures combined with just moderately cool east Pacific sea surface conditions. These unique conditions make it hard to identify analog seasons. The National Multi-Model Ensemble forecasts (Figure 8) for February to April predict a continuation of precipitation dipole between the East Africa/Indian Ocean and Warm Pool regions, similar to what we are seeing in the observations. The March-April-May ensemble climate forecast (not shown) has a similar dipole, but with a weaker intensity. Figure 7. Scatterplot of November-December Warm Pool/North Pacific and Eastern equatorial Pacific sea surface temperature anomalies. Figure 8. The National Multi-Model Ensemble February-March-April precipitation forecast. We next repeat the cross-validated forecast procedure used last month, but based on both November-December and December sea surface temperature fields. Warm Pool, North Pacific and central Pacific sea surface temperatures are used as predictors. We also limit ourselves to making forecasts for just ENSO-neutral and cool seasons. It is very important to note that the March-June data used to train this forecast is just for part of East Africa – southeastern Ethiopia, southern Somalia and eastern Kenya. Hence this forecast only targets a limited region of the Horn, a region strongly influenced by equatorial Indo-Pacific climate anomalies and the Somali Jet. Figure 9. Cross-validated forecasts of March-June East African rainfall. The green dots in Figure 9 show our cross-validated forecasts based on November-December observations. The overall cross-validated skill is modest (R2=0.36), but the ability to distinguish between wet and dry seasons is good. The 2017 forecast based on November-December sea surface temperatures is -0.8Z±1.2Z (red star), where ‘Z’ denotes a standardized departure from normal. This suggests that a below normal season is likely but not all that certain. To capture some of the uncertainty associated with the current climate state, which has seen modest cooling over the last month in the warm Warm Pool and North Pacific regions, and modest warming over the cool Central Pacific region, we also present a forecast based on just December sea surface temperatures. This forecast is also below normal (-0.5Z, blue star), but is less pessimistic than results obtained from November-December. For the -0.8Z forecast, the probability of rainfall being less than -0.5 is 60%. For the -0.5Z forecast, this probability would be 50%. In summary, while current conditions are hard to interpret due to the unique conditions (Figure 7), we are currently seeing a strong overturning East Africa/Warm Pool circulation anomaly (Figures 3 and 4) that climate models predict lasting into February-March-April (Figure 8). Our statistical forecasts anticipate below normal long rains, and this outlook appears substantiated by current circulation anomalies. We will continue to update our analysis on a monthly basis. As we transition out of La Niña-like conditions, we may see Warm Pool precipitation decrease, leading to a more favorable outlook for East Africa. For now, however, a below normal outlook seems warranted. One plausible scenario might be a poor start to the season, with normal rains later in the season.